Rembrandt van Rijn, in full Rembrandt Harmenszoon van Rijn, Rembrandt originally spelled Rembrandt (born July 15, 1606, Leiden, Netherlands-died October 4, 1669, Amsterdam), Dutch Baroque painter and printmaker, one of the greatest storytellers in the history of art, possessing an exceptional ability to render people in their various moods and dramatic guises. Rembrandt is also known as a painter of light and shade and as an artist who favoured an uncompromising realism that would lead some critics to claim that he preferred ugliness to beauty. Early in his career and for some time, Rembrandt painted mainly portraits. Although he continued to paint-andetch and, occasionally, draw-portraits throughout his career, he did so less frequently over time. Roughly one-tenth of his painted and etched oeuvre consists of studies of his own face as well as more-formal self-portraits, a fact that has led to much speculation. The core of Rembrandt’s oeuvre, however, consists of biblical and-to a much lesser extent-historical, mythological, and allegorical "history pieces", all of which he painted, etched, or sketched in pen and ink or chalk. Seen over his whole career, the changes in Rembrandt’s style are remarkable. His approach to composition and his rendering of space and light-like his handling of contour, form, and colour, his brushwork, and (in his drawings and etchings) his treatment of line and tone-are subject to gradual (or sometimes abrupt) transformation, even within a single work. The painting known as Night Watch (1640/42) was clearly a turning point in his stylistic development. These changes are not the result of an involuntary evolution; rather they should be seen as documenting a conscious search in pictorial and narrative respects, sometimes in discussion, as it were, with his great predecessors. Rembrandt quickly achieved renown among Dutch art lovers and an art-buying public for his history paintings and etchings, as well as his portraits and self-portraits. His unusual etchings brought him international fame during his lifetime, and his drawings, which in fact were done as practice exercises or as studies for other works, were also collected by contemporary art lovers. 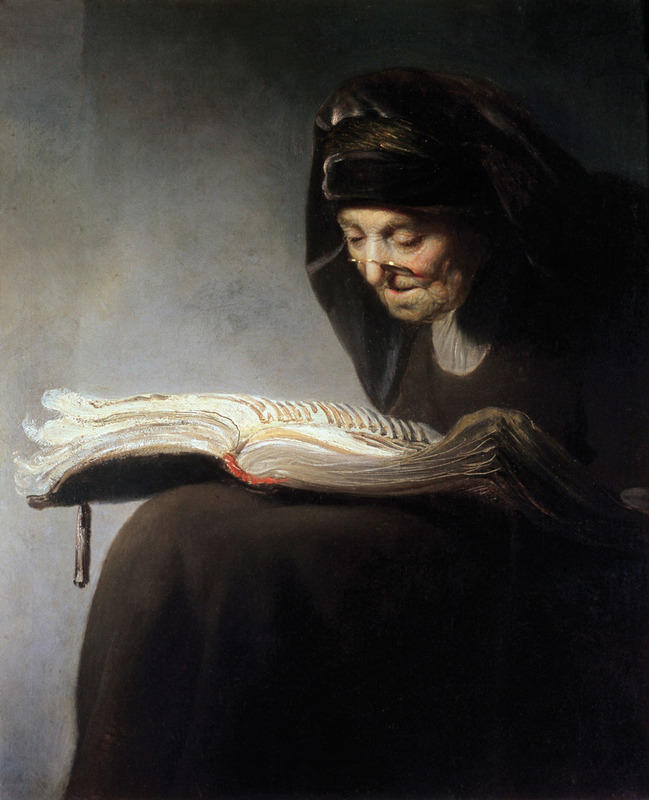 According to the myth that evolved after his death, Rembrandt died poor and misunderstood. It is true that by the end of his life his realism had been supplanted by Classicism and had become unfashionable in Holland. Nevertheless, his international reputation among connoisseurs and collectors only continued to rise. Certain artists in 18th-century Germany and Venice even adopted his style. He was venerated during the Romantic era and was considered a forerunner of the Romantic movement; from that point he was regarded as one of the greatest figures in art history. In the Netherlands itself, his fortunes have once again risen, and he has become a symbol of both greatness and Dutch-ness. 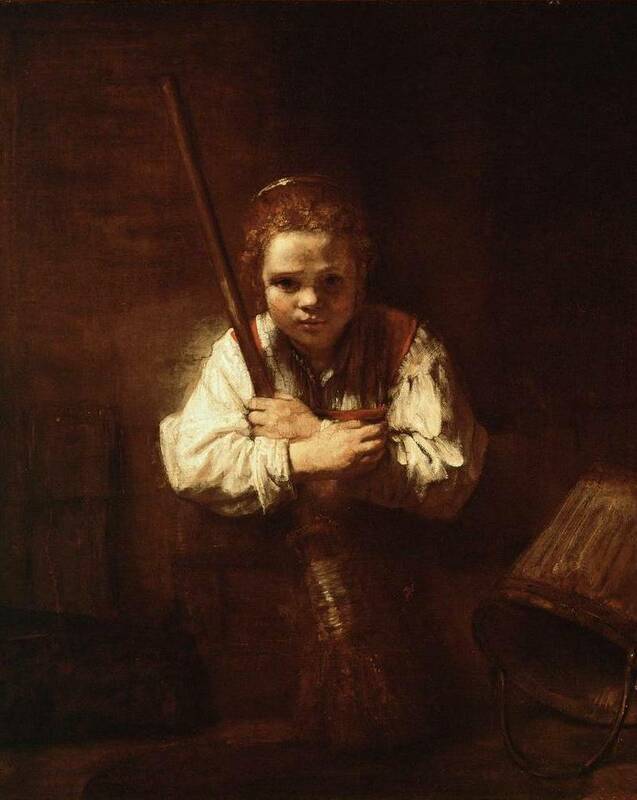 Rembrandt was the fourth of 6 surviving children out of 10. Unlike many painters of his time, he did not come from a family of artists or craftsmen; his father, Harmen Gerritszoon van Rijn (1568-1630), was a miller. His mother, Neeltgen Willemsdochter van Zuytbrouck (1568-1640), came from a family of bakers. The first name Rembrandt was-and still is-extremely rare. It is akin to more common Dutch first names such as Remmert, Gerbrand, and IJsbrand. 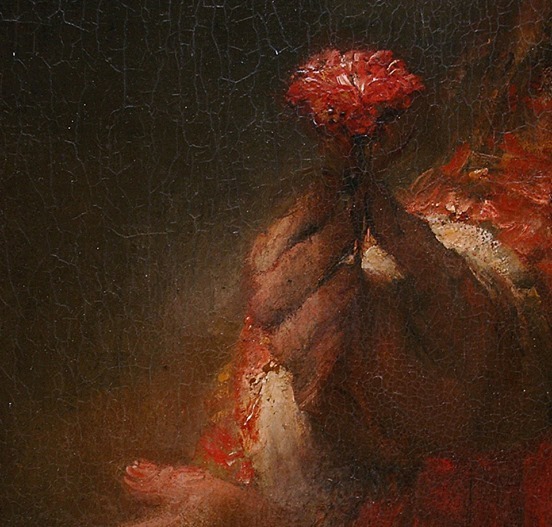 The way Rembrandt inscribed his name on his work evolved significantly. As a young man, he signed his work only with the monogram RH (Rembrant Harmenszoon, "son of Harmen"); from 1626/27, with RHL; and in 1632, with RHL van Rijn (the L in the monogram presumably standing for Leidensis, "from Leiden", the town in which he was born). At age 26 he began to sign his work with his first name only, Rembrant (ending only with a -t); from early 1633 onward until his death, he spelled his name Rembrandt (with -dt) and signed his works that way. It has been suggested that he began using his first name as his signature because he considered himself the equal of the great artists of the 15th and 16th centuries; Michelangelo (Michelangelo Buonarroti), Titian (Tiziano Vecellio), and Raphael (Raffaello Sanzio) were also generally known by their first names. 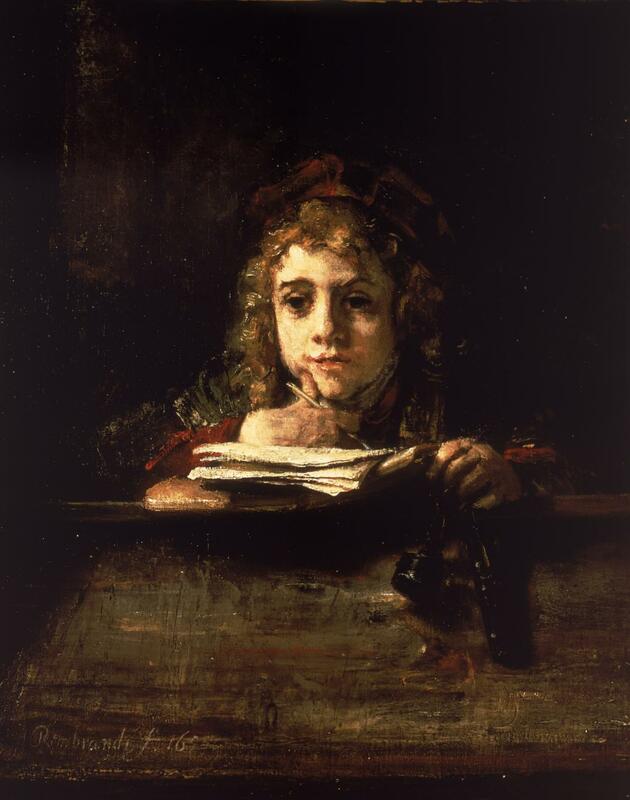 Like most Dutch children of his day, Rembrandt attended elementary school (c. 1612-16), after which, from roughly 1616 to 1620, he attended the Latin School in Leiden, where biblical studies and classics were the main subjects taught. The school’s emphasis on oratory skills may have contributed to his ability to "stage" the figures in scenes depicted in his history paintings, drawings, and etchings. It is not clear whether Rembrandt completed his course of study at the Latin School. His first biographer, Jan Janszoon Orlers (1570-1646), provided a laudatory half-page biography of Rembrandt within his Beschrijvinge der stadt Leyden(1641; "Description of the Town of Leiden"). There Orlers wrote that Rembrandt was taken out of school prematurely and, at his own request, was sent to be trained as a painter. The fact that Rembrandt was enrolled in Leiden University on May 20, 1620, does not necessarily contradict this. Whether for tax reasons or simply because they had attended the Latin School, it was not unusual for Leiden boys to be registered as students without being expected to attend any lectures. The extent of Rembrandt’s intellectual development and any possible influence this might have had on his work remain matters of speculation. From approximately 1620 to 1624/25, Rembrandt trained as an artist. As was quite common in his time, he had two masters in succession. Rembrandt’s first master was the Leiden painter Jacob van Swanenburgh (1571-1638), with whom, according to Orlers, he remained for about three years. Van Swanenburgh must have taught him the basic skills and imparted the knowledge necessary for the profession. He was a specialist in architectural pieces and in scenes of hell and the underworld, which called for skill in painting fire and its reflections on the surrounding objects. 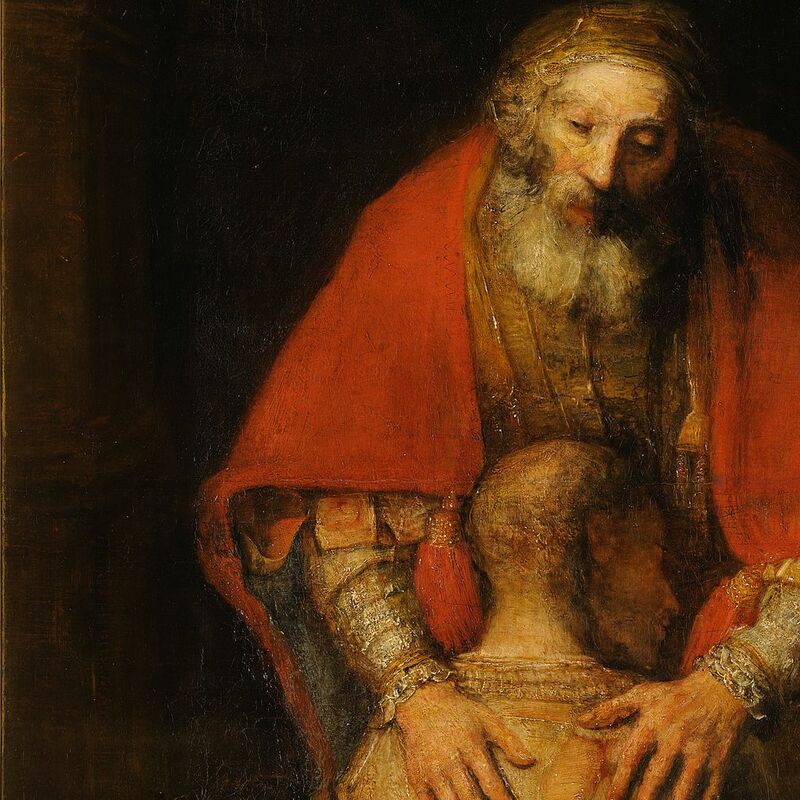 In Rembrandt’s time this skill was considered distinct and demanding. It may well be that Rembrandt’s early exposure to this kind of pictorial problem underlies his lasting interest in the effects of light. 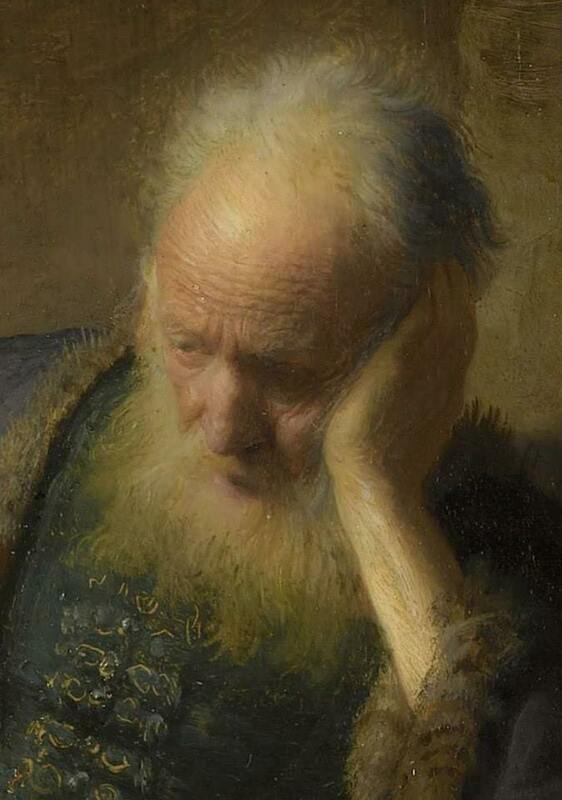 On the basis of stylistic arguments, one could speculate on the impact that Jan Lievens (1607-74) may have had on Rembrandt during his training. Lievens, one year younger than Rembrandt and originally a child prodigy, was already a full-fledged artist by the time Rembrandt must have decided to become a painter. Although scholars know for certain only that Rembrandt and Lievens worked closely together for some years after Rembrandt had returned to Leiden about 1625, following his training with Lastman, the contacts between these two Leiden boys may have begun earlier. However, no trace of Rembrandt’s student exercises has survived. Over the course of 1625, Rembrandt settled in Leiden as an independent master. During the following six years, he laid the foundations for many of his subsequent works and preoccupations. His earliest paintings relied heavily on Lastman’s work. In several instances, he took apart, as it were, the colourful compositions by Lastman and reassembled them into new compositions. (Later, although in a less drastic fashion, Rembrandt’s own pupils would also produce variations on the basis of Rembrandt’s own works.) For an aspiring painter, this was one of the typical methods employed to develop a personal style under a master’s guidance. 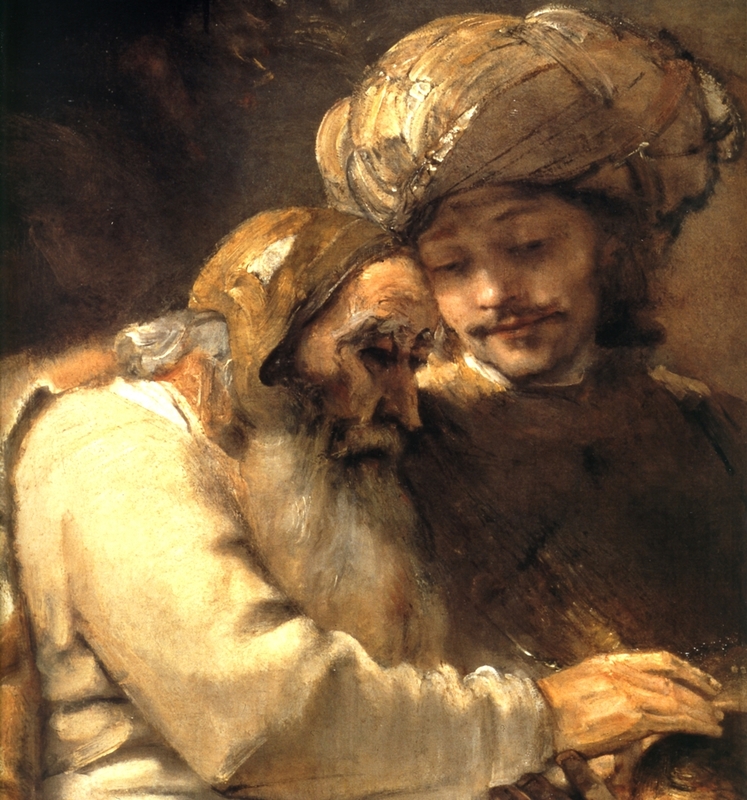 Given the fact, however, that Rembrandt painted his variations on Lastman’s prototypes after he had returned to Leiden as an independent young master, one can speculate that Rembrandt actually may have been trying to emulate his former teacher by choosing the latter’s subjects but completely "rephrasing" them. During his Leiden period, Rembrandt’s production as a painter was mainly devoted to small-scale history paintings and tronies(single figures in historicizing, Oriental, or imaginary costumes that connote old age, piety, soldierly bravery, the Orient, transience, and so on). Tronies were not meant to be portraits, although individuals must have posed for them (among them Rembrandt himself, in the mirror). 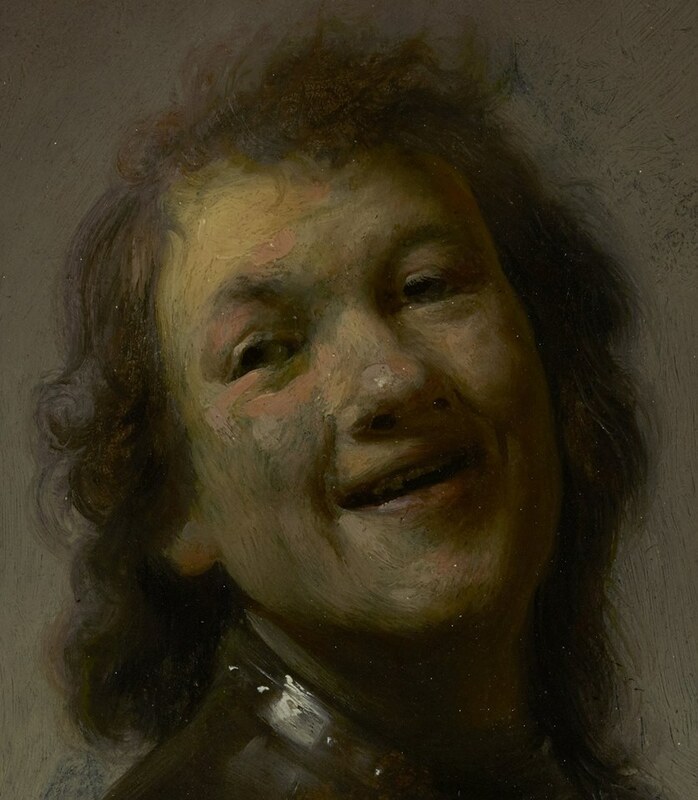 Also during this period, Rembrandt may have shared a studio with Lievens, who, like Rembrandt, had received his final training with Lastman-although six years earlier. The two young painters experimented with the consistency of paint, attempting to use variations in the paint surface to render different materials. 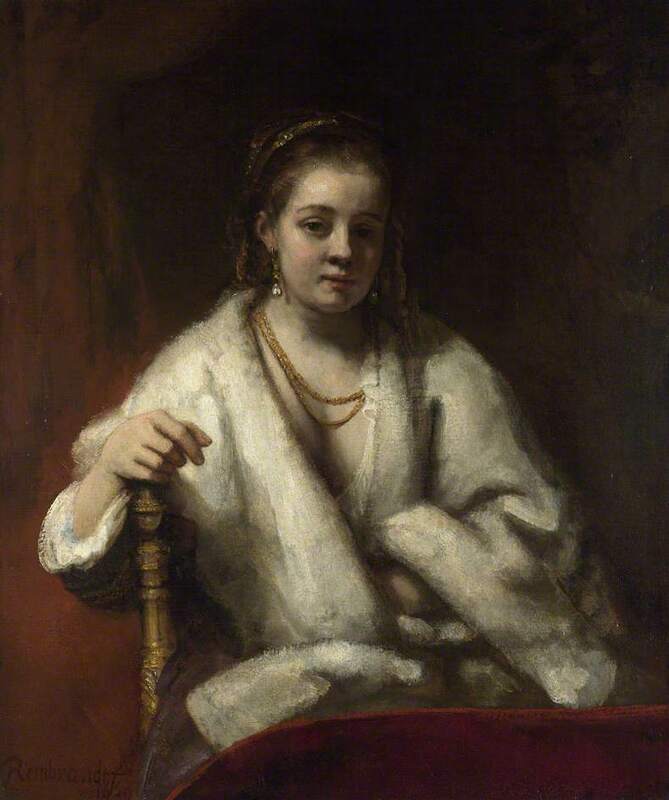 It may well be that Lievens had a stronger influence on Rembrandt in these early years than vice versa. The fact that, about 1630, they both several times painted the same subject (such as the Raising of Lazarus) might suggest that they were competing with each other. The paintings he created soon after leaving Lastman still have a waxworks quality, with evenly lit, colourful figures acting in a clearly organized space. The revolutionary change that took place in Rembrandt’s style between about 1627-1629 involved the role of light. By concentrating the light and by exaggerating the diminuendo of the force of light in relation to the distance from the light source, Rembrandt arrived at what could crudely be termed "spotlight" effects. 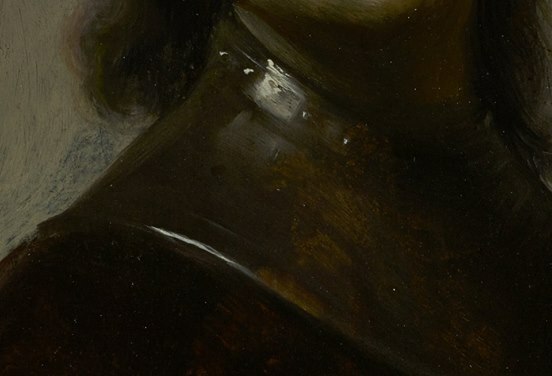 In order to create convincing light effects, Rembrandt-like Caravaggio, his great Italian precursor in this field-had to compensate by leaving large areas shrouded in shadow. 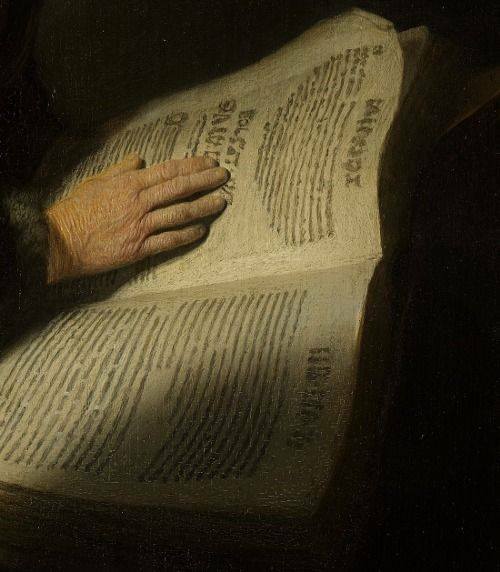 In 1628, in particular in the Peter and Paul Disputing, Rembrandt developed a method by which the lit elements in the painting are basically clustered in one area, in such a manner that little shadow is needed to separate the various forms. By assembling light hues of yellow, blue, pink, green, and other colours, he developed a system of bevriende kleuren ("kindred [or related] colours"). This area of the painting was surrounded by coherent clusters of darker tones that occupied the foreground and background and especially the edges and corners of the work. Through this method Rembrandt not only created a concentrated, almost furnace like, intensity of the light, but he also obtained a strong unity in his composition. This unity enabled the viewer’s eye to grasp the image in one glance, before focusing on the details. Analysis of Rembrandt’s early etched oeuvre gives the impression that he was basically self-taught in this field. Whereas Rembrandt’s contemporaries adopted the regular, almost stylized manner of applying lines and hatchings that could be found in the much more common copper engravings, Rembrandt almost from the outset used a much freer technique, which at first strikes the viewer as uncontrolled, even nervous. 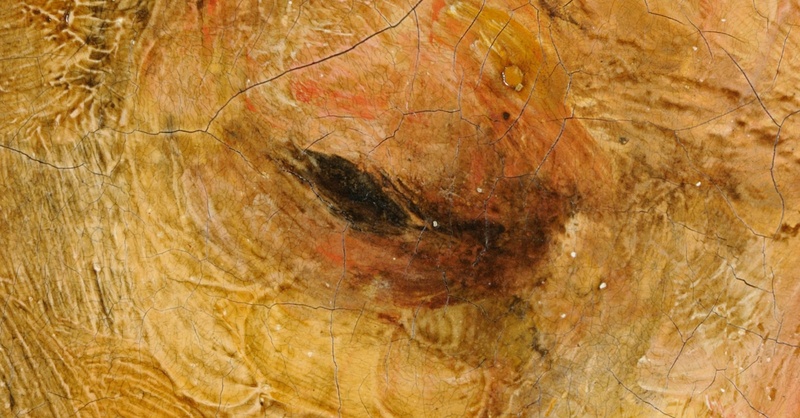 Thanks to this new technique, however, he succeeded in developing a method of working that appears partly sketch like, yet which could also be described as painterly. The painterly quality of his etchings is mainly due to the way in which he achieved an extraordinarily suggestive play of light and dark and how he created a convincing sense of atmospheric space using different methods of hatching. As early as the 18th century, specialists had thoroughly described and explored Rembrandt’s etched oeuvre, mainly for the benefit of print collectors. In the process, much attention was paid to the different stages-the so-called "states"-through which many of Rembrandt’s etchings evolved as well as to the striking variety of papers upon which the etchings were printed. The latter fact led to the general belief that Rembrandt printed his etchings himself. About 1990 the technique of X-ray radiography was applied to the watermarks on the paper; this technique has made it possible to reconstruct editions of prints and, as a result, to obtain greater insight into Rembrandt’s studio practice in this field. 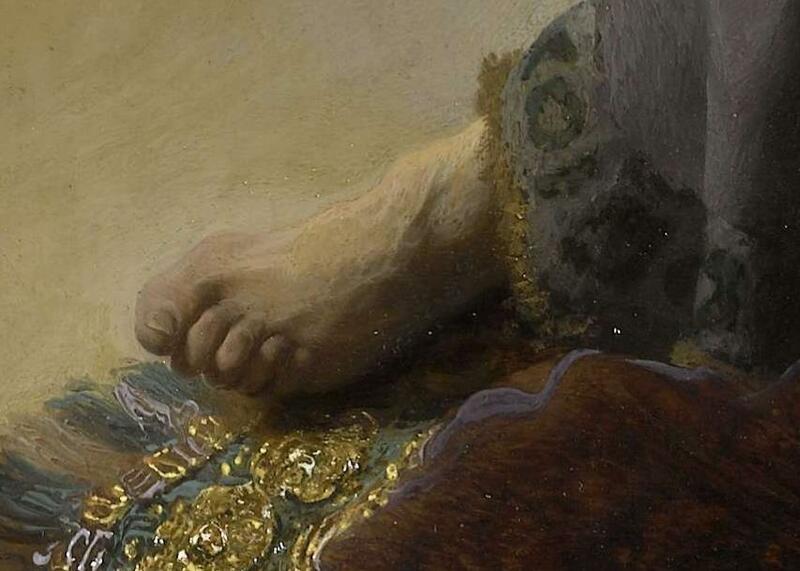 From 1628-1663, Rembrandt had pupils. Gerrit Dou (1613-75), who was later in life noted as a painter of meticulously executed genre paintings and portraits, was probably the first. Over the years Rembrandt’s fame attracted many young men-some from abroad-who were ambitious to study with him once they had completed their basic training elsewhere. It seems that Rembrandt never took beginners. Great talents such as Govaert Flinck, Carel Fabritius, and Aert de Gelder were among these students. 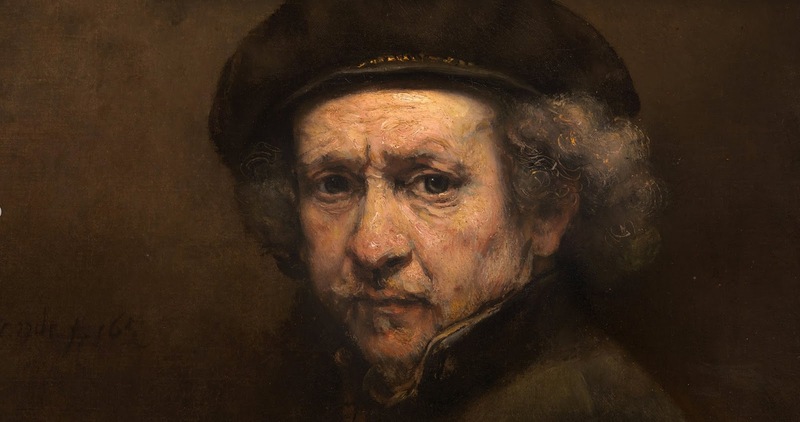 Scholars know of the existence of Rembrandt’s individual pupils mainly by chance, since the official registers of painters’ trainees have been lost in both Leiden and Amsterdam. Only a rough estimate of the number of his pupils is possible. Over his entire career as a teacher (between 1628 and c. 1663) there must certainly have been 50 or so, and possibly many more. The German artist Joachim von Sandrart (1606-88), who lived in Amsterdam from 1637 to about 1645, referred to "countless pupils" who studied and worked with Rembrandt. A pupil’s parents had to pay Rembrandt an annual tuition fee of 100 guilders, a substantial sum, especially since Rembrandt, contrary to custom, did not provide boarding for these young men. According to von Sandrart, this fee, coupled with the sale of his pupils’ works, added substantially to Rembrandt’s income. It is likely that a number of Rembrandt’s pupils-including Isack Jouderville (1613-before 1648), an orphan from Leiden-stayed on as studio assistants for some time. Rembrandt’s students learned, as was common practice in 17th-century studios, by copying their master’s works and, later, by painting and drawing more or less free variations based on them. A passage in Houbraken’s biography of Rembrandt, confirmed by an archival document from 1658, states that pupils worked in an attic in separate cubicles partitioned by sailcloth or paper. In 1631 Rembrandt entered a business relationship with Hendrick Uylenburgh (1584 or 1589-c. 1660), an Amsterdam entrepreneur in paintings who had a large workshop that painted portraits, carried out restorations, and produced copies, among other activities. Rembrandt apparently had already planned or was inspired by Uylenburgh to leave Leiden, then in decline, for Amsterdam, which was thriving. Settling in another town and there becoming a master of the guild-which was essential, since in principle this status alone gave one the formal right to sell work in that town-was not, however, a simple matter. It is known from the guild archives of several towns that a master aspiring to settle elsewhere had first to serve an obligatory period of one or two years in the workshop of a local master before he could be admitted to the guild. This may be the reason that Rembrandt moved into Uylenburgh’s workshop and, over the course of about four years, worked in his service, probably as head of the workshop. Whether Rembrandt had already moved to Amsterdam in 1631 is a point of controversy. Some Rembrandt specialists defend the idea that for several years he commuted between Leiden and Amsterdam. The two towns were then separated by the Haarlemmermeer (a large lake since drained), traversable by regular transport service. It is known, however, that Rembrandt became a member of the Amsterdam St. Luke’s guild only in 1634, the same year that he married Uylenburgh’s niece, Saskia van Uylenburgh (1612-42). From 1631-1635, in Uylenburgh’s workshop, Rembrandt produced a substantial number of portraits (mainly pairs of pendants) and some group portraits, such as The Anatomy Lesson of Dr. Nicolaes Tulp (1632). He must have conquered the Amsterdam portrait market rapidly. Partly relying on his experience as a history painter, he succeeded in producing much livelier portraits than those created by the specialized portrait painters who had dominated the Amsterdam scene before his arrival. By limiting the amount of detail and using simple but dynamic contours, Rembrandt avoided distracting the viewer’s attention. He led the eye primarily to the face and the suggested movement of the figure. 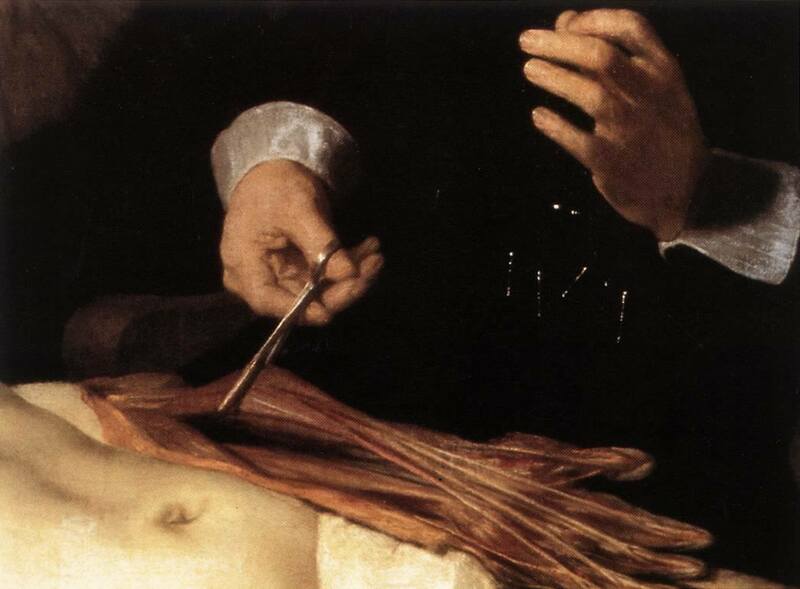 He was also exceptionally good at rendering human skin convincingly. There is doubt, however, about Rembrandt’s ability to capture the likeness of his sitters. Constantijn Huygens, a Dutch diplomat, intellectual, and art connoisseur who discussed Rembrandt in an autobiography about his youth, wrote some epigrammatic Latin verses occasioned by a portrait of one of his friends that Rembrandt had painted in 1632. 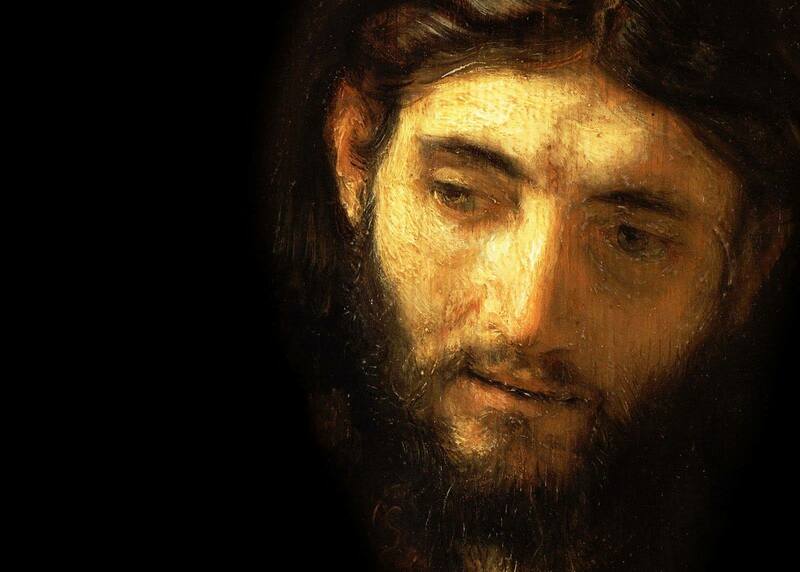 In these verses he wittily mocked the inadequacy of the portrait’s likeness. The doubt that Rembrandt’s portraiture was accurate is only exacerbated when one compares his authentic self-portraits with one another. The physiognomic differences between these images are considerable. In cases where it is possible to compare a portrait by Rembrandt with portraits of the same model by other painters, one has the impression that the likeness produced by Rembrandt was the least accurate. This seems to be the case, for instance, in his portrait of the famous banned Remonstrant preacherJohannes Wtenbogaert (1577-1644), who was also portrayed by Michiel Janszoon van Miereveld and Jacob Adriaenszoon Backer. 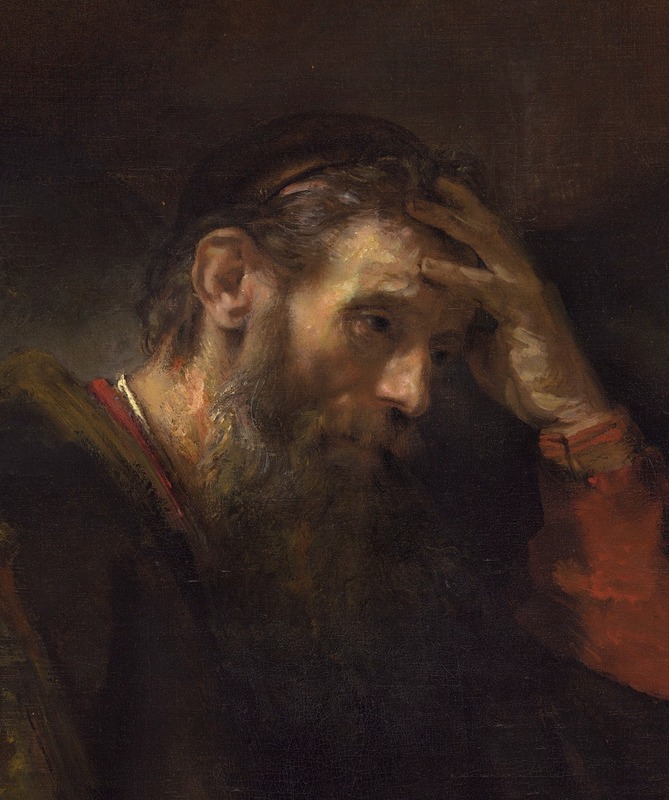 In a self-portrait of 1661, Rembrandt depicted himself as St. Paul. This could perhaps be seen as an indication that he was among those who were deliberately opposed to religious antagonisms as such: in the Epistle to the Corinthians, Paul had warned against sectarian tendencies among the early Christians (1 Corinthians 3: 4-8; 21-22). 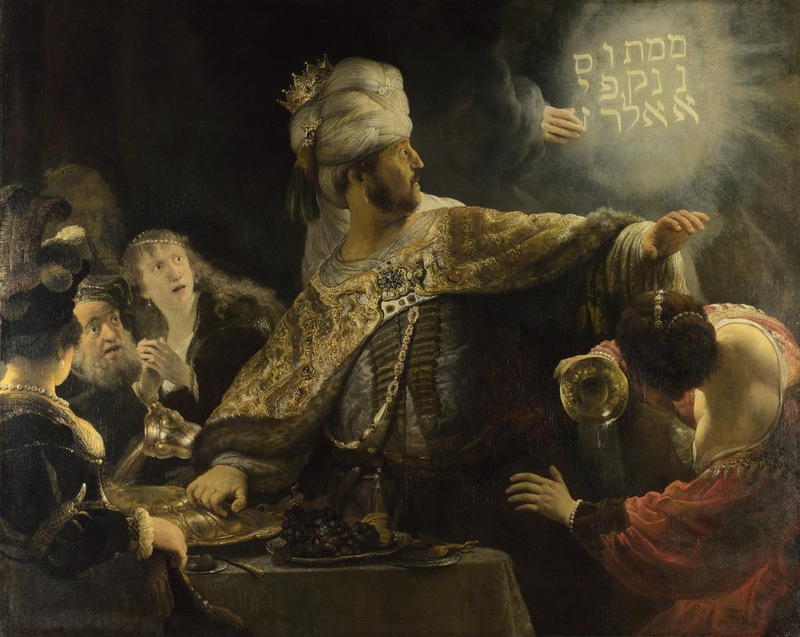 It has also been suggested that Rembrandt believed that the gulf between Jews and Christians should be bridged. His close collaboration and possible friendship with the enlightened Rabbi Manasseh ben Israel, a strong advocate of reconciliation between Jews and Christians, may be an indication of this. 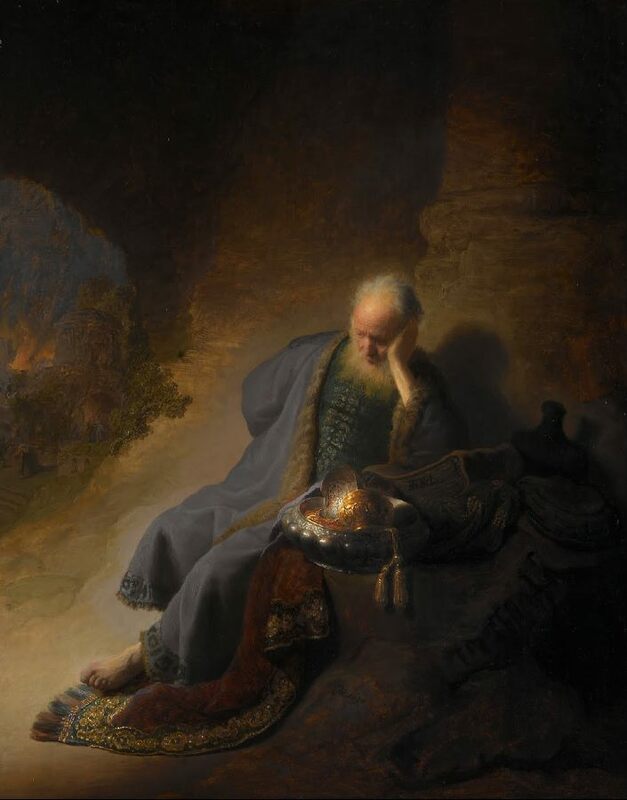 That Rembrandt depicted so many Jews and Old Testament figures with such evident sympathy would further support this idea. During Rembrandt’s early Amsterdam period, the towering presence of Peter Paul Rubens was often felt. For a long time Rembrandt scholars tended to speak of Rubens’s influence on Rembrandt whenever they attempted to explain the Rubensian elements in Rembrandt’s work. But perhaps it is more appropriate to see Rembrandt as measuring himself against Rubens-as seen, for example, in a comparison of Rembrandt’s Descent from the Cross (1632/33) with the print after Rubens’s Descent from the Cross that Rembrandt unquestionably used. 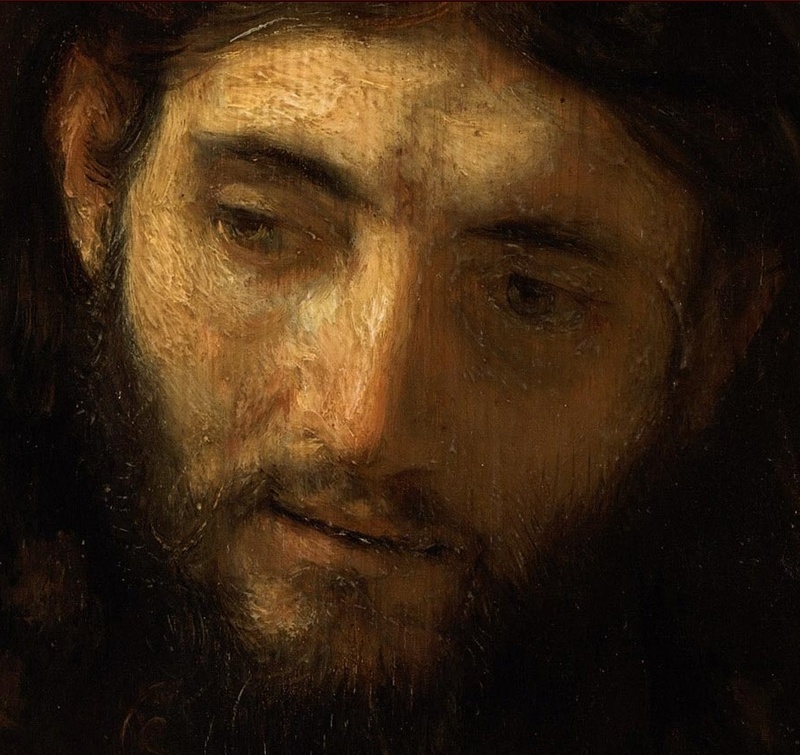 Such a comparison shows that Rembrandt had fundamentally transformed Rubens’s heroic pathos into a powerful realism that evokes in the viewer a deep sense of involvement in Christ’s suffering. It is documented that Rembrandt presented a large painting to Constantijn Huygens-who was at that time secretary to Prince Frederik Hendrik (1584-1647), the Dutch stadholder-as a gift in appreciation of Huygens’s having acted as an intermediary with the stadholder’s court. In view of the measurements documented, the painting concerned could have been either the Blinding of Samson or the Danaë (both from 1636) in its original form. It seems that Huygens did not accept the gift. Rembrandt must have experienced the years around 1640 as the high point of his career. His fame had spread rapidly. In 1641 Orlers noted that Rembrandt was "so talented that he has since become one of the most esteemed painters of this century". In Rembrandt’s day there was a fast-growing but distinct interest in art and artists, with a public that was designated as Liefhebbers van de Schilderkonst ("Lovers of the Art of Painting"). The art lover’s main purpose was to understand paintings so as to be able to discuss them with other devotees and, preferably, with painters as well. Both the artist and the art lover of Rembrandt’s day were inspired by the special relationship between Alexander the Great and his court painter, Apelles (as recounted by Pliny the Elder), and the almost equal footing that Titian enjoyed with Emperor Charles V. They admired and identified with these great role models of the past in terms of both the mutual relationship enjoyed by artist and patron and the importance each attached to the pursuit of the art of painting and to the deeper knowledge of that art-a mixture of art history,art theory, and technical understanding. Studio visits became popular. Texts written by artists for art lovers, and some by the latter themselves, give the impression that the insights gained from studio visits to a great extent concerned the "miracle" of creating an illusion of reality on a flat surface, the pictorial and technical means employed in creating that illusion, and the many aspects of the reality that was to be rendered-such as the natural grouping of the figures in a painting, the proportions of the figures and the expressiveness of their poses and gestures, the play of light and its reflections, the natural rendering of draped fabrics, and the use of colour. The phenomenon of the art lovers and their studio visits may be key to understanding Rembrandt’s self-portraits. The greater part of Rembrandt’s activity in front of the mirror has long been considered to be a highly personal quest for the "self". According to the latest insights, however, these works must be seen, on the one hand, as portraits of an uomo famoso ("famous man") and, on the other hand, as specimens of the reason for that fame: Rembrandt’s singular style and his exceptional technique in painting and etching. The 1640 self-portrait belongs to a category of paintings that could be termed trompe l’oeil works. With these paintings viewers are momentarily deceived by the sensation that they are in the same space as the painting’s subject, forgetting that they are looking at a flat surface and subsequently experiencing the pleasure of this deception. Among Rembrandt’s paintings from the period 1639-42, there are also still lifeswith dead birds, portraits, and group portraits that use trompe l’oeiltricks. 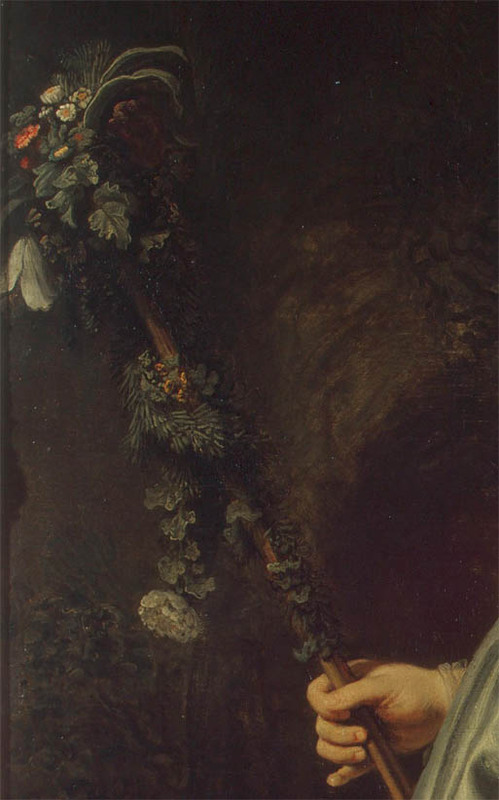 Some of his pupils of that period, including Samuel van Hoogstraten, Fabritius, and Rembrandt’s German pupil, Christoph Paudiss (1630-66), continued to exploit trompe l’oeil effects. The artist with whom Rembrandt was most preoccupied during the second half of the 1630s was Leonardo da Vinci, and in particular his Last Supper (1495-98), which Rembrandt knew from a reproduction print. It is evident from several of Rembrandt’s sketched variants (1635) on Leonardo’s composition that he was above all intrigued by the problem of the symmetry/asymmetry in the grouping of the figures. The Wedding of Samson (1638) can be seen as Rembrandt’s attempt to surpass Leonardo in the challenge set by this compositional problem and as an effort to accomplish a much livelier scene than Leonardo had achieved in his Last Supper. The Company of Frans Banning Cocq and Willem van Ruytenburch, better …DeA Picture Library In 1640-42 Rembrandt must have been occupied mainly with the large group portrait depicting members of an Amsterdam civic militia company. In a family album belonging to the captain of the company, the work is described as: "the…captain gives order to his lieutenant,…to march out his company of citizens". This implies that the 34 figures in the painting-actually only 18 militia men out of a company of some 100 men who had decided to have themselves portrayed, plus the 16 extras Rembrandt had added in order to suggest a large group of people-were crowding together just before the company was to assemble for a parade. In his painting of this scene, which later would acquire the name the Night Watch, Rembrandt revolutionized the formula of the group portrait as part of his continuing effort to achieve the ultimate liveliness in his work. In the words of van Hoogstraten, Rembrandt’s former pupil, "Rembrandt made the portraits that were commissioned subservient to the image as a whole". According to van Hoogstraten, Night Watch was conceived by Rembrandt to be a unity (eenwezich). 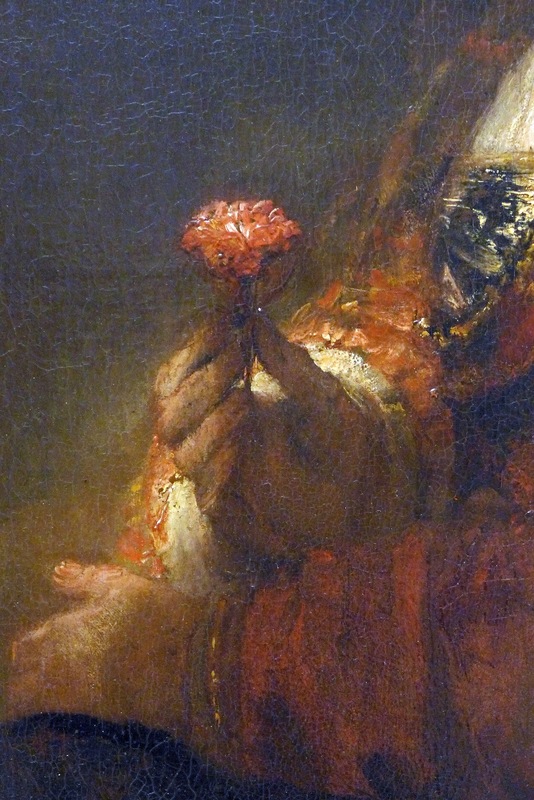 Rembrandt’s intentions in this respect are difficult to appreciate in the painting’s present state, since it has been trimmed on all sides, most of all on the left side. As a result, the figures of the captain and his lieutenant have moved to the centre and into the utmost foreground of the composition. 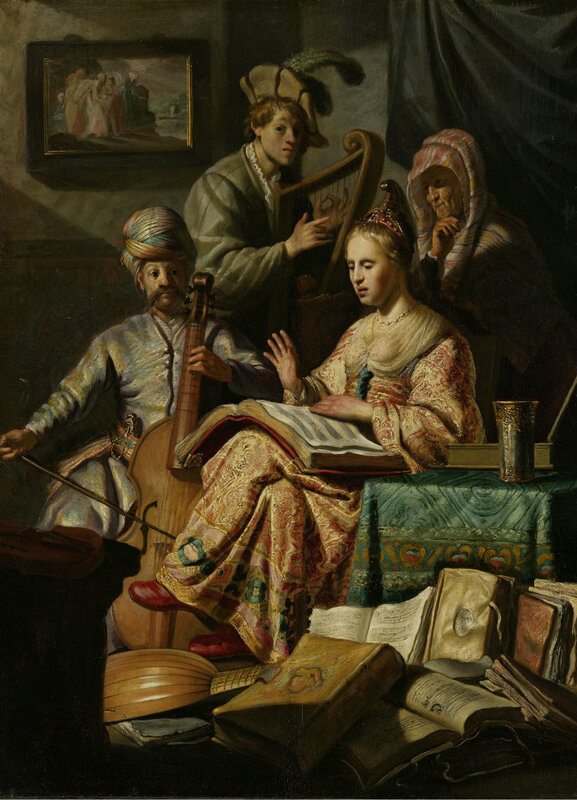 A copy, painted by Gerrit Lundens (1622-after 1677) soon after the Night Watch was finished, shows that the original composition was much more dynamic and coherent than its present state indicates. The present condition of the painting also reveals the work’s crucial problem, which is at the same time its most intriguing feature. Two intensely lighted figures dominate the composition: the girl in the middle ground and the lieutenant in the foreground. Both are clad in yellow costumes, which strengthens the light effect. Because of this double "spotlight" effect, the tonal values of the painting as a whole seem to be subdued. Consequently, the painting makes a dark impression that no doubt contributed to the epithet "Night Watch". Van Hoogstraten, who had praised the unity in the Night Watch’s composition, criticized his former master by complaining, "I would have preferred if he [Rembrandt] would have kindled more light into it". Van Hoogstraten’s remarks were published in his book on the art of painting. His notes on the subordination of the portraits to the conception as a whole, and the lack of light in the painting, have contributed to the myth of Night Watch being rejected and of Rembrandt’s subsequent "fall". In the decade following 1642, Rembrandt’s production changed in several ways. 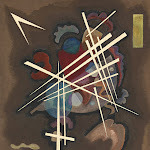 His output of paintings diminished drastically, and the few paintings he made varied in subject, size, and style. Moreover, he produced no painted portraits, a fact that can be interpreted in two ways: either he did not receive any portrait commissions during that period or he did not accept such commissions for the decade. At the same time, he embarked on a number of extremely ambitious etchings, such as the portrait (1647) of his friend Jan Six (1618-1700) and especially the Hundred Guilder Print, a large (unfinished) print with episodes from chapter 19 of The Gospel According to Matthew. The sparseness of Rembrandt’s production of painting in the period from 1643-1652 is one of the enigmas of his career. Speculations about what happened after he finished the Night Watch have contributed to the development of the "Rembrandt myth", according to which Rembrandt became largely misunderstood and was ignored after 1642 and, as a consequence, suffered increasing financial difficulty and eventually died in poverty. At the same time, according to this myth, his art deepened. The post-1642 Rembrandt would develop into the "real" Rembrandt, profoundly at one with his inner self and a classic example of a misunderstood genius. As art historian Jan Emmens argued in his book Rembrandt and the Rules of Art, the formation of this myth owes much to a standard biographical model that might be called the "Saul-Paul model"-according to which the subject’s life suddenly undergoes a radical change in direction as the result of a crisis or conversion. 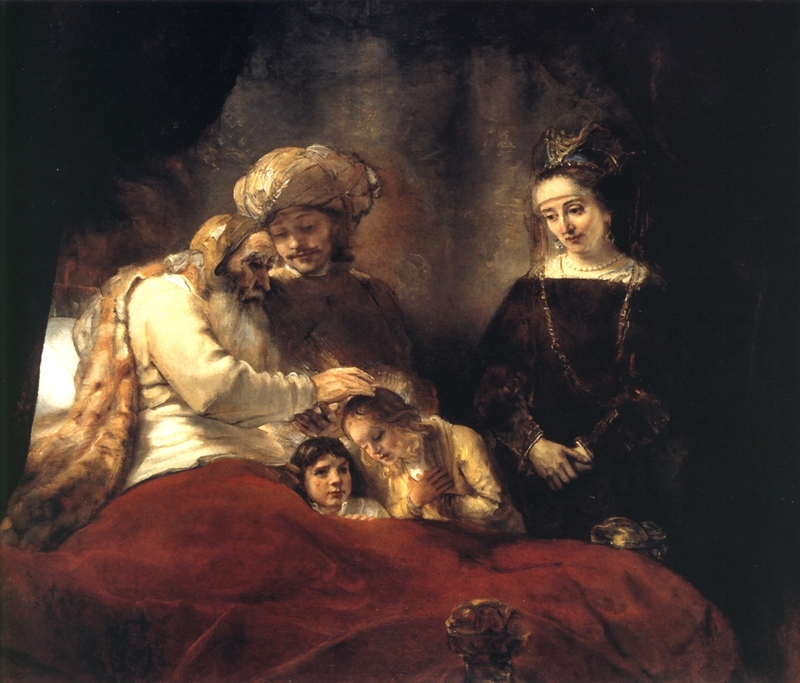 The death of Rembrandt’s wife, Saskia, and the presumed rejection of the Night Watch by those who commissioned it were long supposed to be the most important events leading to the presumed change in Rembrandt’s life after 1642. But modern art-historical research has questioned the myth of a crisis in 1642, not least because there is simply insufficient evidence that the Night Watch was not accepted. The painting was paid for and remained exhibited in the place for which it was intended. Consequently, it cannot have been rejected. As to the other cause of the presumed turning point in Rembrandt’s life, nothing is known about Rembrandt’s feelings over the deaths of Saskia and three of the children they had together, although these and other aspects of his private life have been amply romanticized in the older Rembrandt literature. One must also take into account the omnipresence of premature death in the 17th century. Death during or after childbirth was a fate that awaited many women, and waves of the plague repeatedly ravaged Europe throughout the century, claiming many victims in Amsterdam. 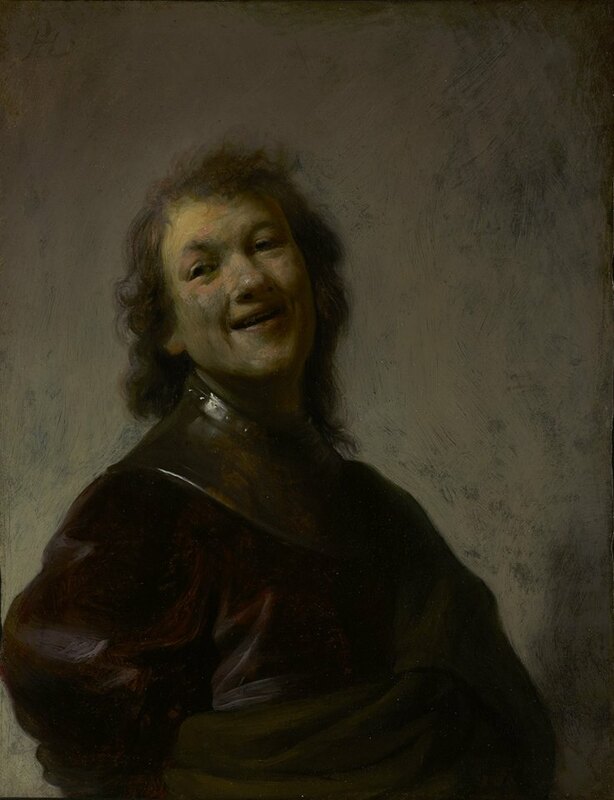 The "underrated genius" myth arose mainly out of the criticism of Rembrandt’s art that was expressed after his death by some of his largely younger peers. On the face of it, a significant number of 17th-century writings seem to have portrayed Rembrandt in an unfavourable light. He was said to be a heretic in the field of painting and an artist who, with his use of impasto (locally applied thick paint), painted with "dung". Such criticisms should be examined in light of the rise of Classicism imported from France, which had brought about a radical change in taste over the course of Rembrandt’s later life. Rembrandt’s drastic and uncompromising realism had no place in the universalizing and idealizing approach of Classicism. Adhering to the practice [Rembrandt] had adopted, he was prepared to challenge our rules of art, of anatomy, human proportions and perspective, arguing against the use of antique sculptures, against Raphael’s draughtsmanship and the systematic training of young artists, and against the Academies, so vital to our profession, asserting that one should rely only upon nature and observe no other rules. The criticism levelled against Rembrandt by the writers of the 1670s makes it clear that he was still the towering figure of an older, and now old-fashioned, generation of Dutch painters. That is why the blows of the classicistic attack, which could have been just as well delivered to any other painter of his generation, all fell on his head. Negative remarks from Rembrandt’s critics were in fact almost always counterbalanced by the highest praise. The brilliant artist and writer on art Gérard de Lairesse (1640-1711), who met Rembrandt as a young man and was portrayed by him in 1665, confessed in 1707: "I do not want to deny that once I had a special preference for his manner; but at that time I had hardly begun to understand the infallible rules of art". Everything that art and the brush can achieve was possible for him, and he was the greatest painter of the time and is still unsurpassed. For, they say, was there ever a painter who by means of colour came as close to nature by his beautiful light, lovely harmony, and unique, unusual thoughts [as to the narrative?] and so forth? But if criticism of Rembrandt’s art became manifest only in the 1670s, how could the sudden decline in Rembrandt’s production of paintings between 1643-1652 then be explained? It is not impossible that, after having painted the Night Watch, Rembrandt arrived at the awareness that he may have overstretched the possibilities of the pictorial language he had developed over the previous two decades. It seems as though he had reached an impasse with his spotlight effects. 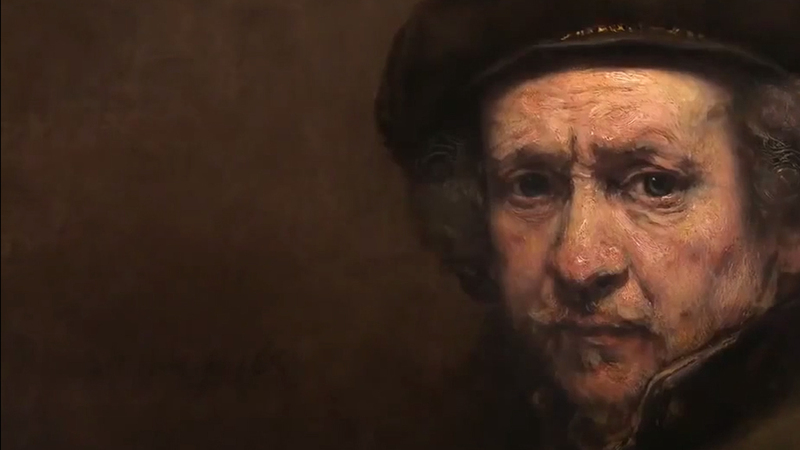 Might it be that in the end Rembrandt’s crisis was an artistic crisis? This possibility seems to be strengthened by his apparent search for ways out of this cul-de-sac. The great variation in style in his sparse paintings from the decade after 1642 can be seen as an indication that Rembrandt was searching. A scene with the Holy Family (1645) is one of Rembrandt’s most-striking efforts to arrive at a different approach to the function of light in his paintings. Here he introduced three light sources and made abundant use of light reflecting on one surface from another. 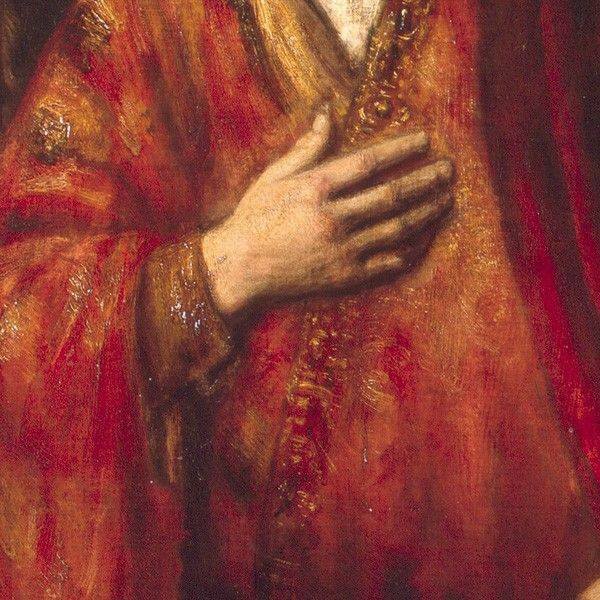 In this painting he also introduced strong colour, through the glowing red of Mary’s gown. Colour, which up to this point he had increasingly sacrificed to light, now returned-usually a strong red-in the centre of some of his images, such as Jakob’s Blessing and, later, in the so-called Jewish Bride. Compositions-which were often diagonal in early works by Rembrandt, according to the logic of the concentrated light-were now more frontally constructed. After creating several highly detailed images, such as The Woman Taken in Adultery (1644) and The Supper at Emmaus (1648), Rembrandt eventually seems to have sought the solution to his artistic "crisis" in a style grafted onto that of the late Titian, a style that was only effective when the painting was seen from a certain distance. Rembrandt’s contribution to this Titianesque manner of painting was a deliberate use of impasto that created a light-reflecting surface in the lighter foreground passages of his paintings. His efforts to develop this new approach to painting started about 1645 and would bloom from the early 1650s onward. That period marks the beginning of what is usually called Rembrandt’s "late style". The most obvious aspect of Rembrandt’s late style is that the brushwork is, in general, broader. Individual brushstrokes sometimes remain visible, although the differentiation in the brushwork is extraordinary. Another aspect of the late style is that the brushwork, on whatever scale applied, seems to be governed much more by chance than before. Specifically referring to Rembrandt’s late style, Sir Joshua Reynolds observed, in the 12th of his lectures published as Discourses on Art: "Work produced in an accidental manner, will have the same free, unrestrained air as the works of nature, whose particular combinations seem to depend upon accident". This freedom of the hand, however, does not lead to gratuitous sketchiness. The mysterious quality of Rembrandt’s later work is that the intensity of observation and the painterly execution seem only to have grown, compared to his earlier work. But whereas the brushwork is livelier, the figures in Rembrandt’s later works are characterized by a remarkable stillness. In the early Rembrandt works, each gesture, each movement of the bodies was typified by the naetuereelste beweechgelickheijt ("the most natural liveliness"), fulfilling Rembrandt’s aim to create convincing "drama". Despite the near absence of gesture in his late work, however, the viewer senses that the image is not frozen but rather potentially dynamic. It may well be that the figures seem to be alive because of the vitality of the execution as well as the blurring of the forms that results from an "open" treatment of contours. 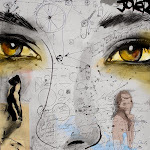 No doubt it is the vitality of either the brushwork in the paintings or the line in the etchings and the drawings that contributes to this feeling of a continuous state of transition. In all this, light plays a new role, different from the role it played in the early works. 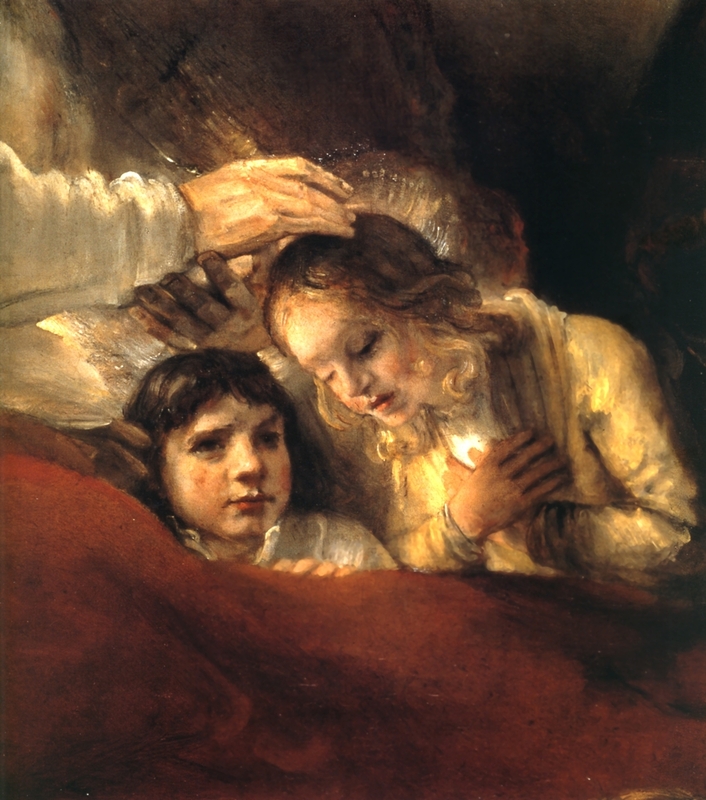 From early on, one of Rembrandt’s major concerns was the creation of a hierarchy in light intensity within a painting. In the works of the 1650s and ’60s, this logic seems to develop a magic quality as well. Whereas in the early works strong local light effects prevail, in the later works the space seems to be filled with light lingering around the figures. An example is the seemingly illogical way in which the light radiates from the bust of Homer in the Aristotle of 1653. The same phenomenon is evident in the figure of Jakob in Jakob’s Blessing (1656) and in the Conspiracy of the Batavians (1661). The light reflecting in the space around some of the figures seems to act as a mysterious aura. A number of events in Rembrandt’s domestic life during the 1640s point to a crisis of another kind. 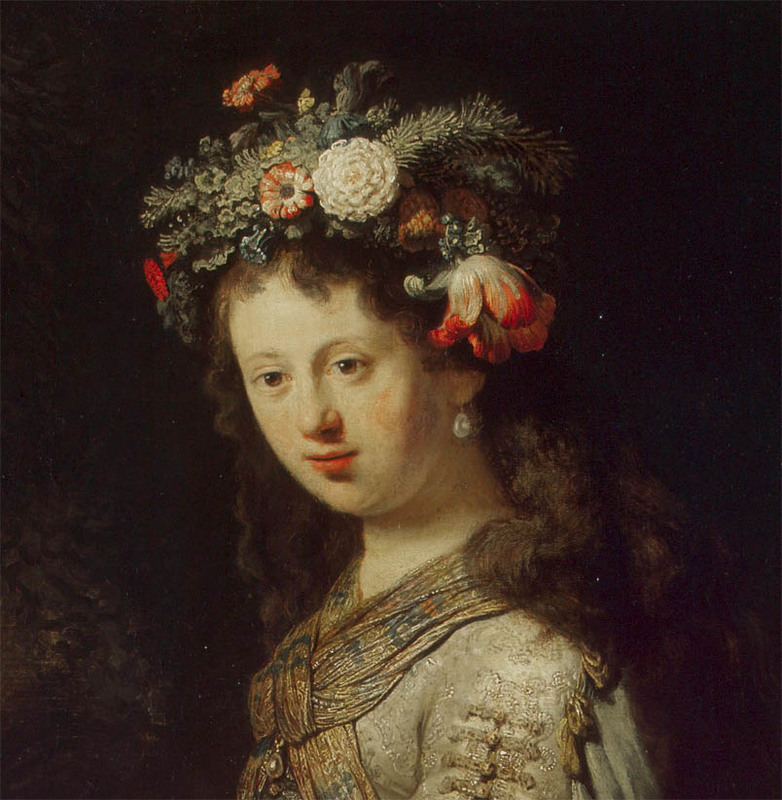 A large number of documents have survived concerning marriage, childbirth, and Saskia’s death, as well as the tensions between Saskia’s family and Rembrandt over matters of inheritance after her death. A considerable volume of archival material also documents Rembrandt’s legal problems with a woman by the name of Geertje Dirckx (1610/15-c. 1656), who after Saskia’s death nursed Rembrandt’s only surviving child, Titus (1641-68). 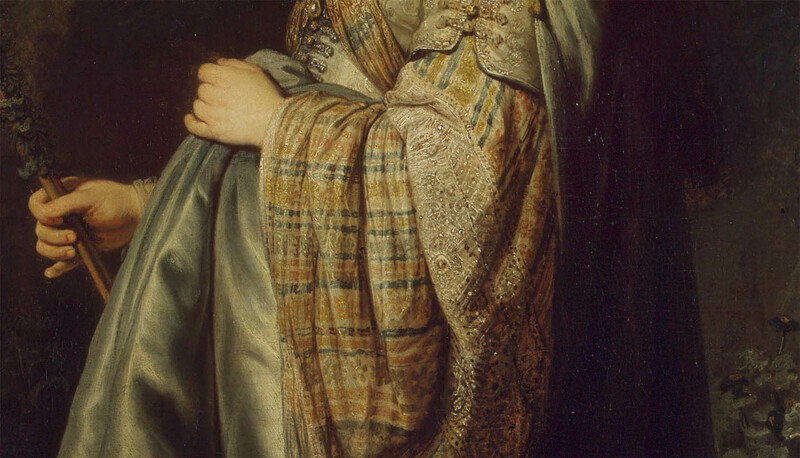 Rembrandt must have gotten entangled in an intimate relationship with Dirckx, who had become his housekeeper. 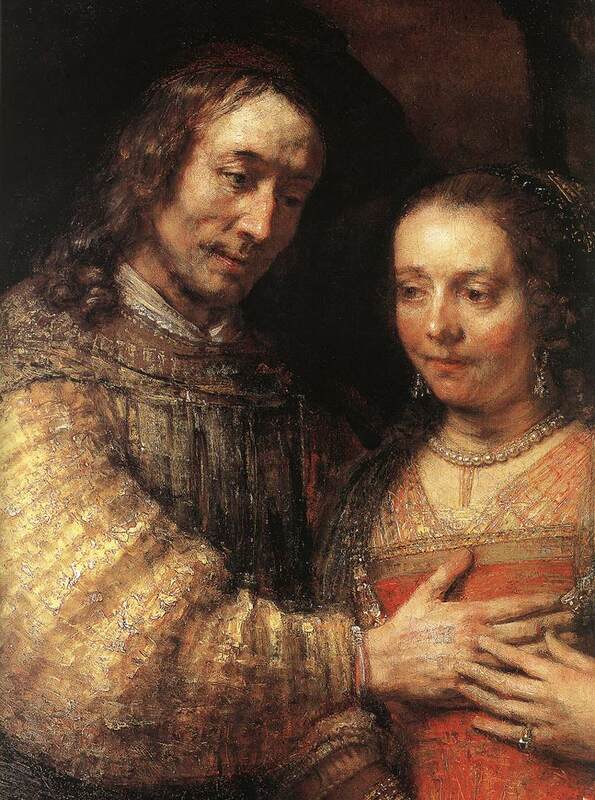 In 1649 Dirckx said that Rembrandt had promised to marry her. 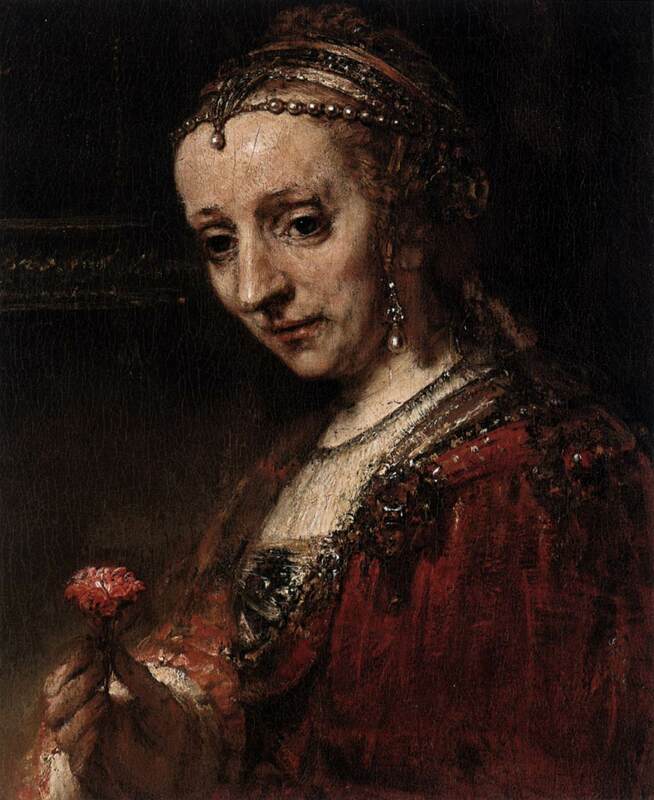 In that same year the situation came to a climax when she pawned some of the jewelry that was part of Saskia’s inheritance to Titus; she claimed to have received it as a present from Rembrandt. In 1650 Rembrandt arranged for Dirckx’s confinement in the House of Correction (Spinhuis) at Gouda; she remained there until 1655. 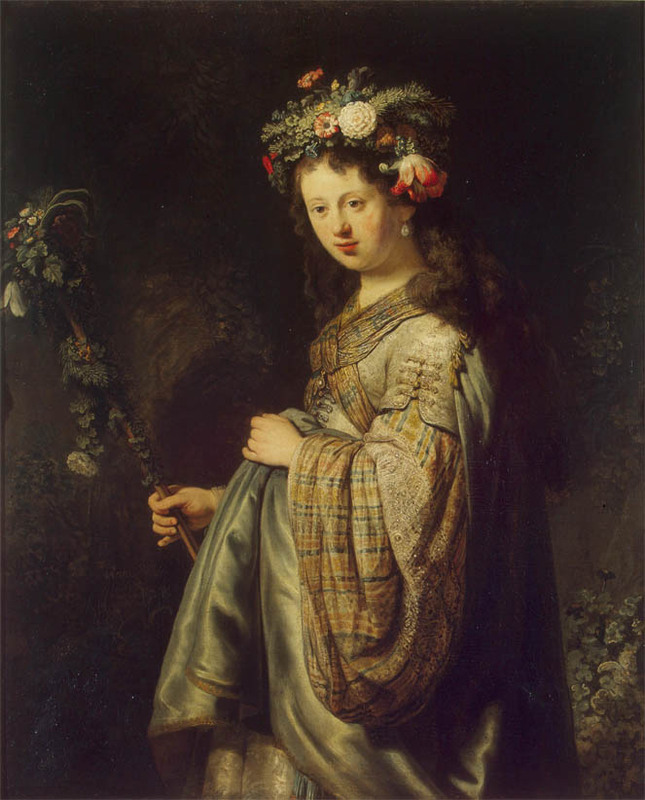 In 1649 Hendrickje Stoffels (1626-63), a young woman from Bredevoort in the eastern part of Gelderland, succeeded Dirckx, first in the function of housekeeper, later in Rembrandt’s affection. 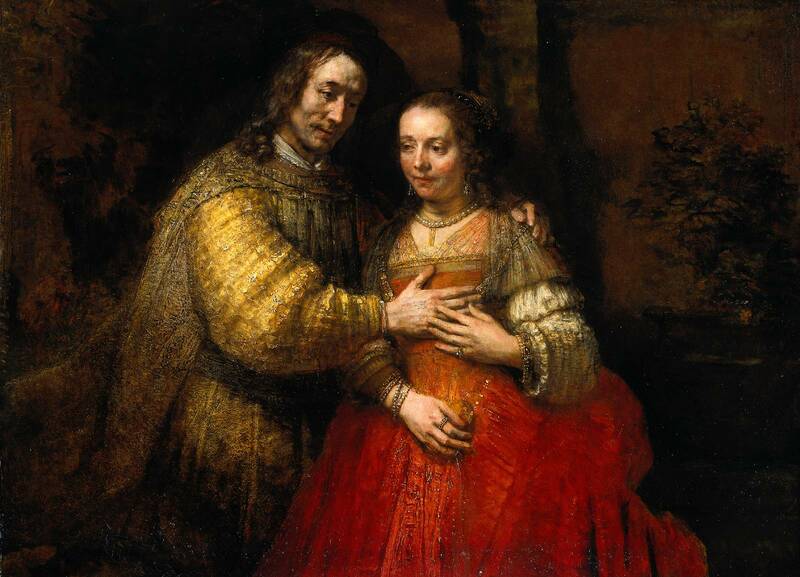 The problems associated with Titus’s inheritance prevented Rembrandt from marrying the young Stoffels, who bore him a child and lived with him as his common-law wife from 1649 until her death in 1663. Despite the artistic crisis of the 1640s, Rembrandt’s fame certainly had not waned. Between 1652-1663 he sold several paintings to the nobleman Don Antonio Ruffo, from Messina in Sicily. It is clear from the correspondence concerning these commissions that Rembrandt’s art, especially his etching work, was highly esteemed in Italy. Since Ruffo must have bought the first of these paintings, the famous Aristotle with a Bust of Homer, without knowing its subject, it must surely have been mainly Rembrandt’s fame that attracted him. Van Hoogstraten in his book on painting refers to "name-buyers", a phenomenon that apparently grew parallel to the emergence of the art lover. Once Ruffo was aware of the subject of his painting, he subsequently ordered an Alexander the Great (1662; lost in a fire) as a companion piece and a Homer Dictating to His Scribes (1662/63), which, though heavily damaged-probably in the same fire-is preserved in the Mauritshuis in The Hague. Despite this fame, in the first half of the 1650s Rembrandt increasingly incurred financial problems, brought on to a considerable extent by his own financial mismanagement. He had neglected to pay off the debt on the house he had bought in 1639. On top of that, he had not received or accepted portrait commissions since 1642. Calculations show that the sums he spent on his collection up to the year 1656, when he finally went bankrupt, would have been more than adequate to pay off the loan he had taken out to purchase his house. Already in his Leiden period, Rembrandt may have started to build what was to become a richly varied personal collection. From 1628 onward his works exhibit carefully depicted ethnographic and other exotic objects. 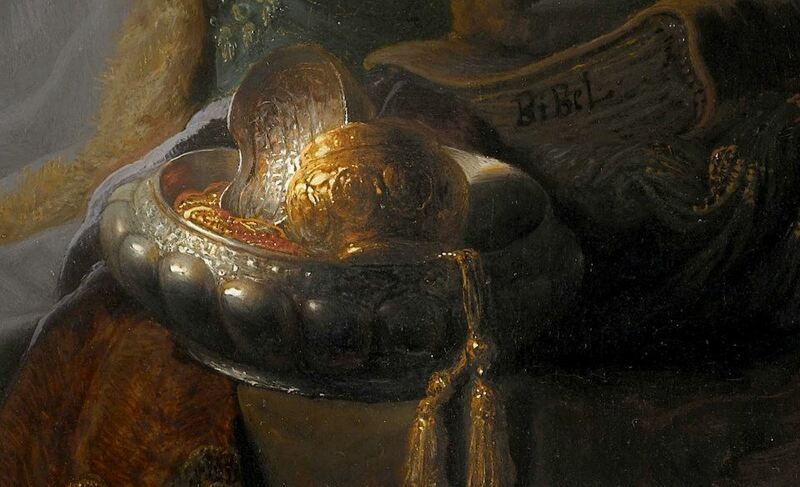 In that period Rembrandt may have begun to assemble a collection of both naturalia (natural objects such as shells and coral) and artificialia (man-made objects such as medals, plaster casts from busts of Greek philosophers and Roman emperors, weapons, and musical instruments from a variety of cultures). 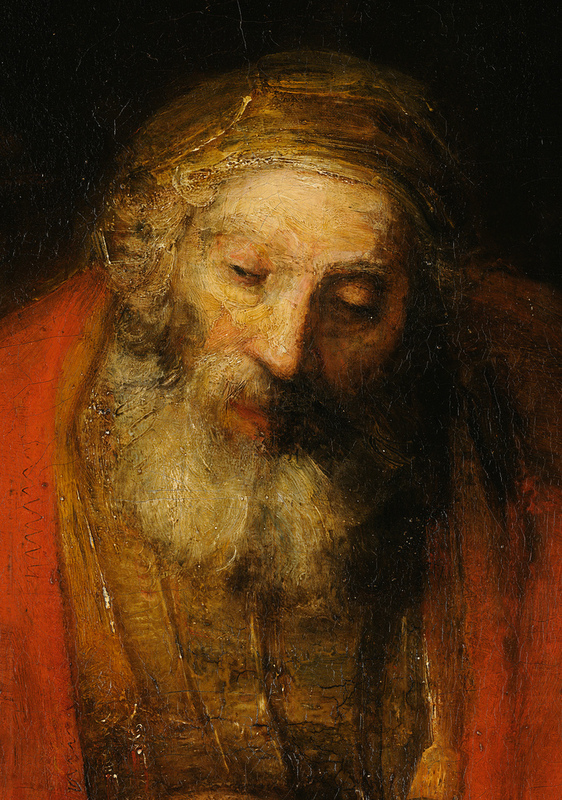 The functional significance of this collection for Rembrandt is still not entirely clear. Was it just a varied range of studio props or an accumulation of precious objects for trade? (It is known that Rembrandt was also active as an art dealer.) Or was it perhaps an encyclopaedic collection of the type that might enable the miller’s son to move in higher circles as a gentleman virtuoso? As to the collection of prints and paintings, this must have been the source of Rembrandt’s considerable art-historical knowledge, which at times became manifest in his own works. 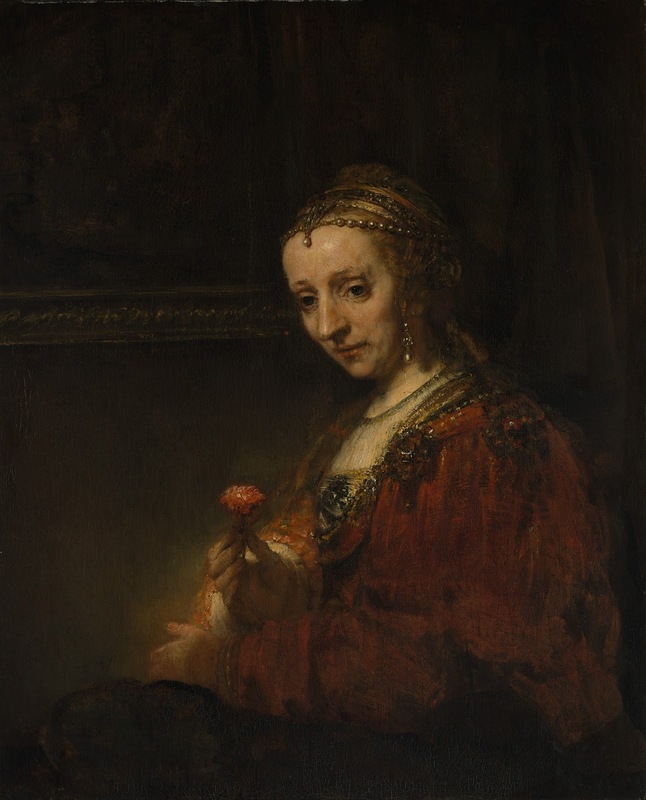 It is hard to escape the impression that, for Rembrandt, collecting must have been virtually an addiction. Having sold his house and moved to a much smaller rented house, Rembrandt soon began to collect again. By the time of his death, two rooms of that house had been filled with this new collection. But was he really ruined only by his collecting mania and his financial mismanagement concerning his house? The historical context provides another clue to his bankruptcy: it occurred at a time when many other artists went bankrupt and when other sorts of business concerns also ran into financial difficulties. It transpires that this wave of insolvencies coincided with or followed the first Anglo-Dutch War (1652-54), when a blockade of the Dutch coast dealt a severe blow to the country’s trade with the East. There is evidence that it was precisely the manufacturers of luxury goods-and Rembrandt’s expensive paintings can certainly be included in this category-who suffered most as a result. This general financial malaise caused by the blockade led creditors to call in their debts. 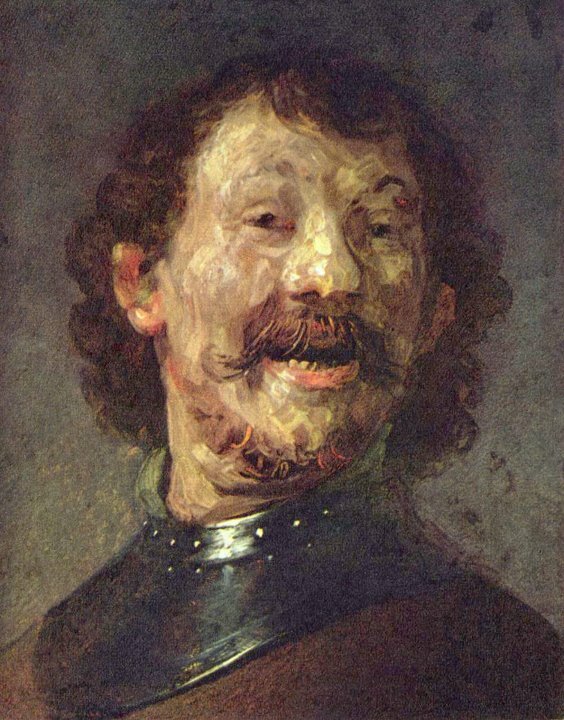 The documentary evidence suggests that it was this effect of the war that was fatal for Rembrandt. Having sold his house in 1658, Rembrandt rented a house on the Rozengracht. 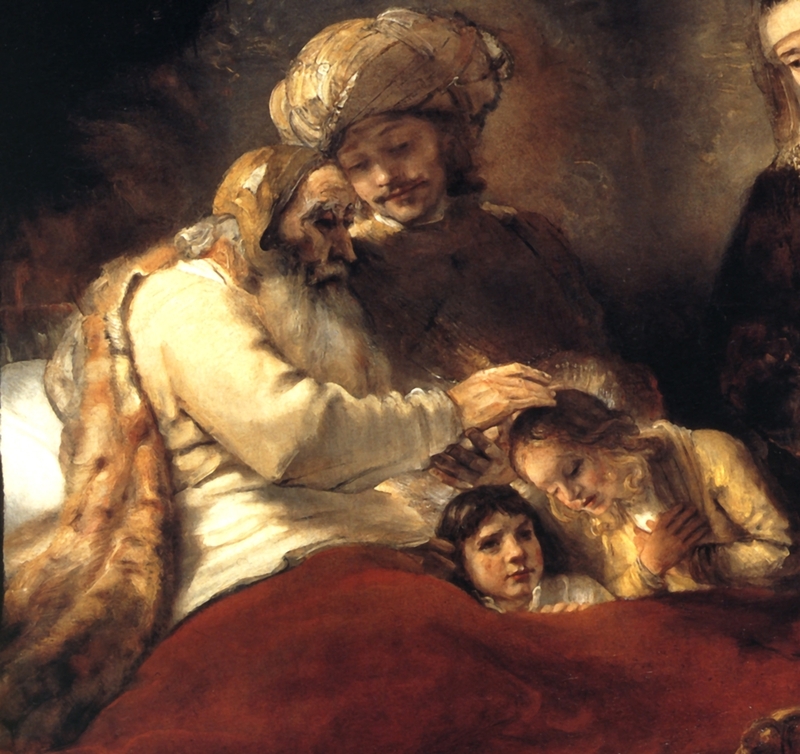 In 1660 a contract was drawn up between Rembrandt, his son, Titus, and Hendrickje Stoffels. This was designed to protect Rembrandt from his creditors and to enable him to continue working. 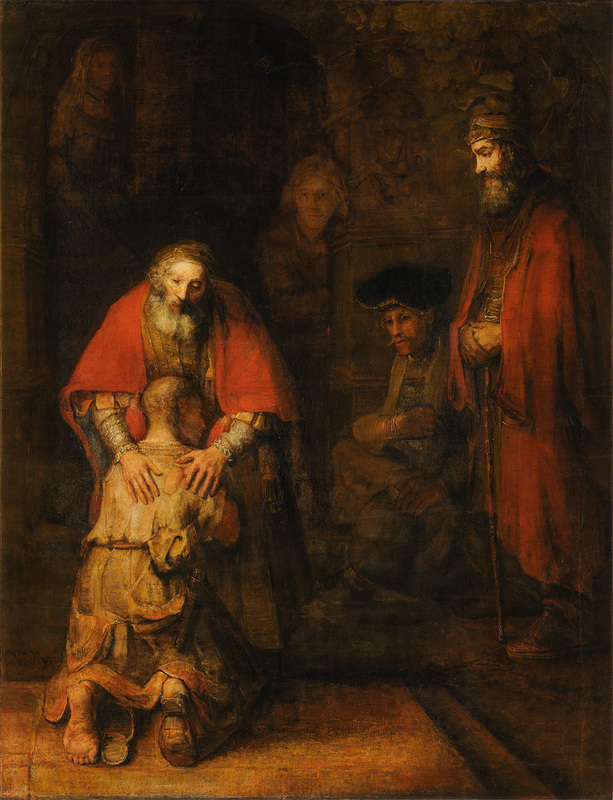 The agreement entailed that Rembrandt should "give aid and assistance" to the other two parties, and then it stipulated that "Rembrandt] would live with them, receive free board, and be exempt from housekeeping expenses and rent on condition that he will aid the partners in every respect to the extent possible, and promote the business". In reality, Rembrandt now worked in the service of his son and his common-law wife, as the agreement continued: "Having been granted some time agocessio bonorum [conveyance of goods], the reason why he has given up everything and has to be supported". This does not mean, however, that the painter had been pushed to the margins of society, not even after both Titus and Stoffels had died. Emmens’s conclusion, mentioned above, that the old Rembrandt was still considered a "towering" figure in his time is supported by several interesting documents. For instance, on December 29, 1667, Rembrandt was visited by Prince Cosimo de’ Medici, the future grand duke of Tuscany. In the prince’s travel journal, Rembrandt was referred to as "pittore famoso" ("famous painter"). Only two of the other artists Cosimo visited were referred to as "famoso", Gerrit Dou and Frans van Mieris. Cosimo probably bought one of Rembrandt’s late self-portraits in the summer of 1669 on a second visit he is thought to have paid to Rembrandt. These visits surely indicate that Rembrandt was esteemed highly until his death. This is confirmed by the discovery among the papers of the southern German art lover Gabriel Bucelinus of a list with the "Names of the Most Distinguished European Painters" in which Rembrandt was mentioned. It is striking not only that Bucelinus recorded his name as a distinguished painter but that Rembrandt is the sole painter in this list of 166 names to whose name was appended the note "nostrae aetatis miraculum" ("miracle of our age"). This may have been one of the situations in which Rembrandt proved to be a headstrong, self-willed man. He may well have gained the reputation of a man not malleable to his patrons’ wishes. 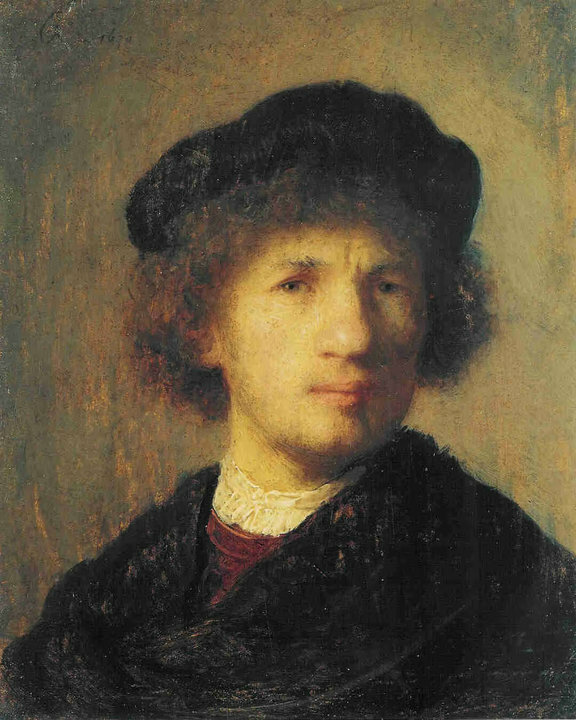 Baldinucci, on the authority of Rembrandt’s Danish pupil Eberhard Keil, makes mention of "Rembrandt’s lack of conformity" and points out that "his singularity in his way of painting corresponded to his way of life". Baldinucci continues, "He was an umorista [capricious man] of the first order and disdained everybody. When he worked he would not receive the greatest monarch in the world; a king would have to return again and again until he finished his work". These statements may be exaggerated, but other documents confirm that they must contain some truth. 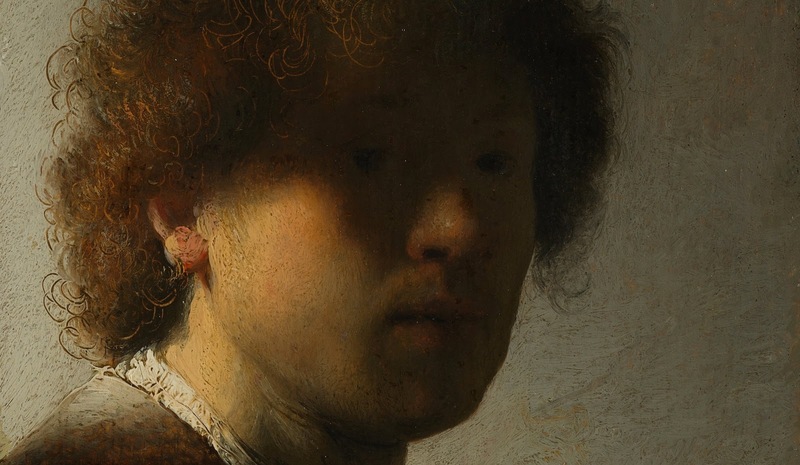 Baldinucci further remarks that "Rembrandt associated with people below his station; the artist’s ugly and plebeian face was accompanied by dirty and untidy clothes because it was his habit to wipe his brushes on himself while he worked and to do other things of a similar nature". But one should temper Baldinucci’s characterization with the testimonies of Rembrandt’s contemporaries, such as Huygens and von Sandrart, from which Rembrandt emerges as a person who was so intensely devoted to his work that he neglected everything that would interfere with it, including many social niceties. Nevertheless, the old Rembrandt still received commissions, mainly for portraits, among which a group portrait of the sampling officials of the Amsterdam Drapers’ Guild (The Syndics of the Amsterdam Drapers’ Guild, 1662), an anonymous family group (mid-1660s), and an anonymous Portrait historié as Isaac and Rebecca (1667), better known as The Jewish Bride (portrait historié is a phrase used to indicate a portrait in which the sitter is-or in this case the sitters are-rendered in a historic role with historicizing costumes). Shortly before his death Rembrandt was preparing a number of copperplates for an etched Passion, commissioned by the Amsterdam art lover Dirck Cattenburgh (1616-1704). He did not finish this project. Rembrandt is renowned for his outstanding ability to render the human figure and its emotions. He also was unusually gifted as an artist; the way in which he handled his pen or chalk, the etching needle, or the brush betrays a great sensitivity and spontaneity, and the resulting works convey a sense of freedom and creativity. Rembrandt thought about and experimented with purely pictorial matters-the possibilities of composition; the role of tone and colour in the creation of pictorial space, light, shadow, and reflection; and how to vary the properties of his paint to obtain specific effects-with sharp intelligence and originality. 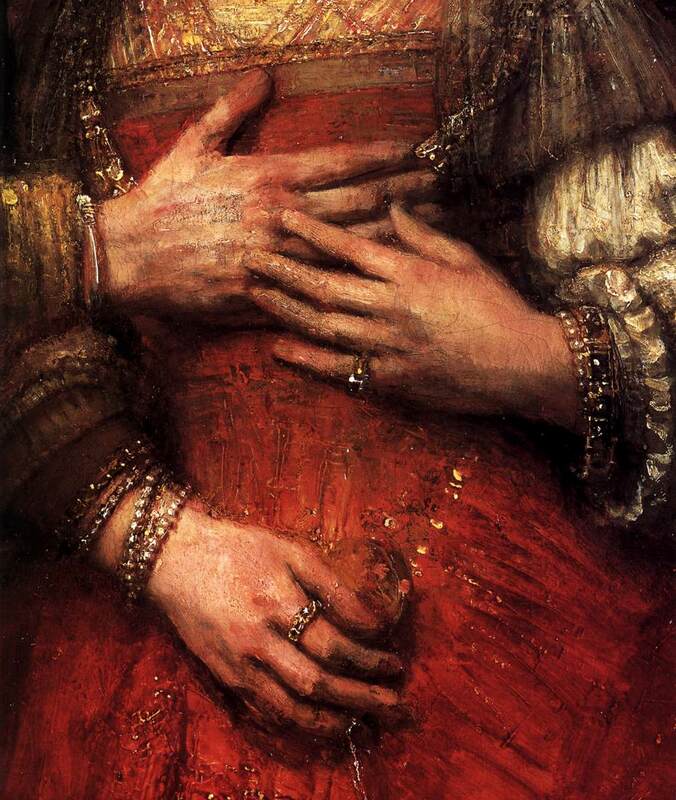 Another aspect of Rembrandt’s genius is the acute and loving attention with which he observed the world around him. In his renderings of women and children and of animals and landscapes, he showed a strong understanding of the significant detail, but he noted these impressions with extraordinary freedom and economy. This dual quality made him exemplary for later artists and, in some ways, one of the first "modern" artists. Rembrandt was an innovator in technique in all three of his media. From his early, colourful history paintings to his glowing late works, it is clear that he was an artist continuously in search of new stylistic modes of expression and that he belongs to that small category of artists whose development never ceased. Rembrandt’s evolution culminated in his remarkable late style, usually considered to be the summit of his art. 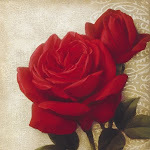 In this sense, he may be compared with painters such as Titian and Goya or composers such as Beethoven and Verdi. Paradoxically, Rembrandt’s continually changing style, which seems so personal, was faithfully imitated by his pupils in each of its phases. This accorded with the common workshop practice of his time. 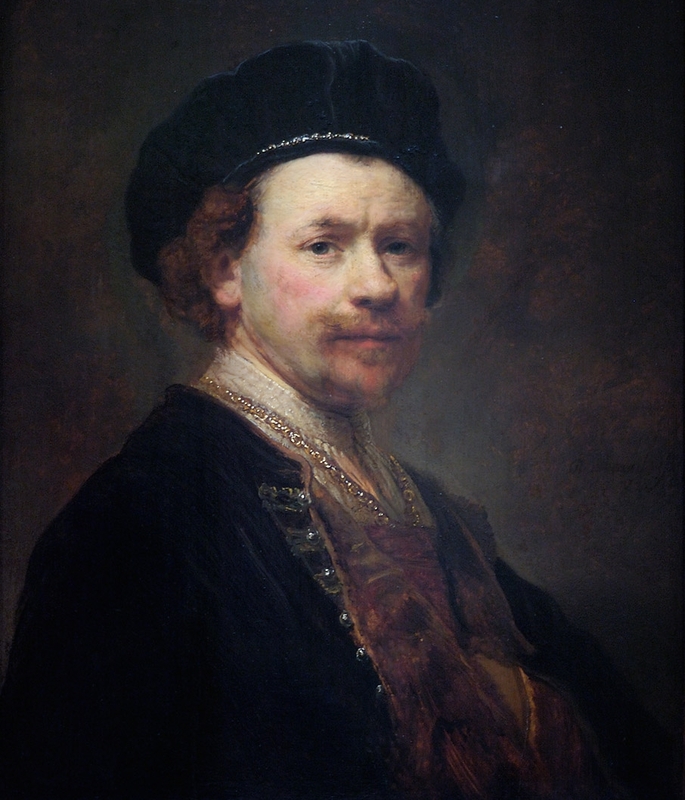 However, since so many young artists wished to be trained in Rembrandt’s workshop, this training practice-in which his pupils produced marketable paintings and etchings in Rembrandt’s style-subsequently caused much confusion (still unresolved) over the authenticity of many of the works that were traditionally attributed to Rembrandt. The Rembrandt Research Project has extensively researched the authenticity of paintings attributed to Rembrandt. Among those paintings that have survived to be investigated, however, many have suffered the ravages of time. Some have darkened over time, others have been changed in format, and still others have been cleaned and restored too drastically. 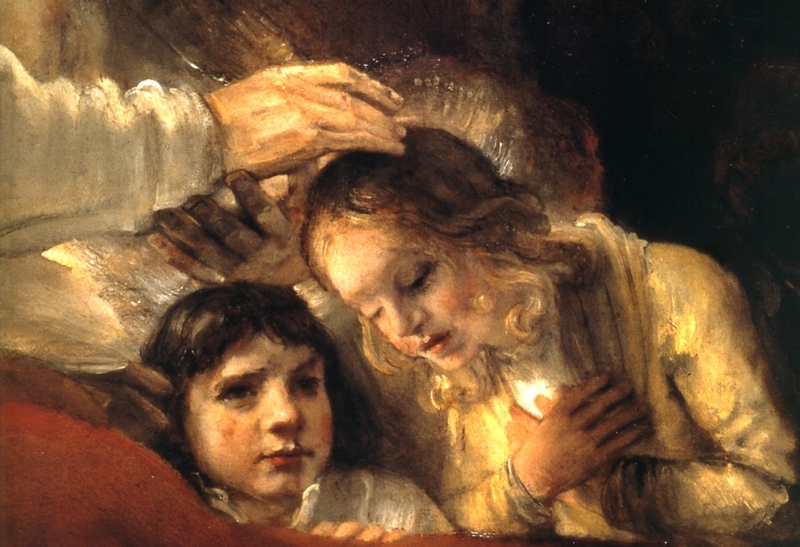 One thing is certain, however: the number of faked Rembrandts is negligible, because so many school works could easily-often mala fide-be upgraded to "genuine" Rembrandts or were for long unrecognized as school works because of their closeness to a (corrupted) image of Rembrandt’s personal style. Many of the same attribution problems that apply to Rembrandt’s paintings continue to challenge scholars studying his drawings. Adding to this challenge is the fact that many of his drawings have been lost. Authenticity issues regarding Rembrandt’s etchings have also arisen, albeit to a lesser degree than with the paintings and drawings. The posthumous impressions from Rembrandt’s copperplates that continued to be printed well into the 19th century and the production of photographically generated facsimiles have all caused much confusion. Scholars are aware of about 80 of Rembrandt’s etching plates that have been preserved. In the past, scholars struggled to find methods that could solve questions concerning attribution and Rembrandt’s artistic practices. This struggle came about in part because very few of Rembrandt’s works are so conclusively documented that there can be no doubt as to their authenticity. Consequently, the foundation on which to reconstruct his oeuvre is very narrow. At the same time, written statements by Rembrandt on artistically and biographically relevant issues are extremely rare. Only a few (business) letters from his own hand have survived, and they rarely bear on artistic matters. Because of this scarcity of contemporary evidence, scholars long felt constrained to speculate on issues of authenticity. 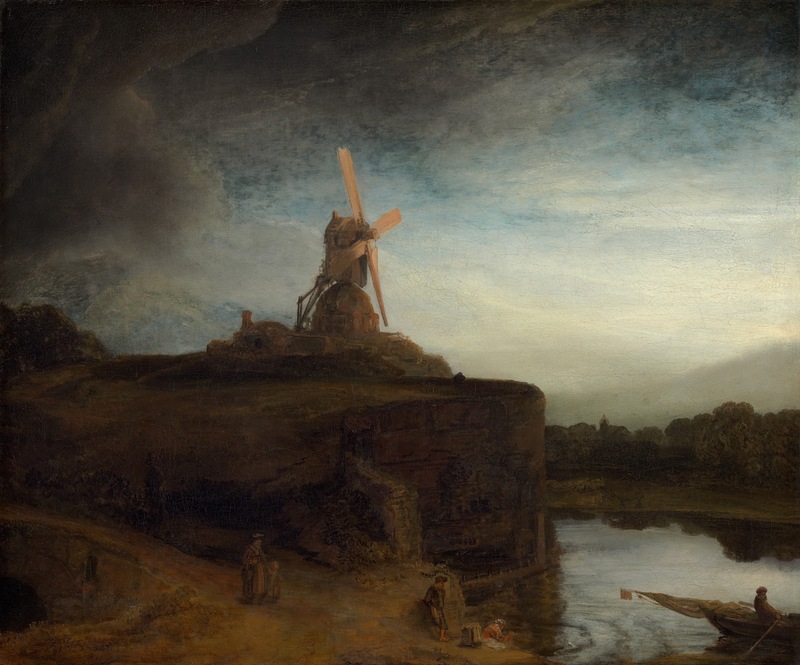 Rembrandt research took a step forward in the later decades of the 20th century, when works by Rembrandt and his school began to be investigated as material objects subject to scientific methods of inquiry. These investigations provided information about the artist’s technique and, indirectly, his ideas on art and teaching. In correlating this information with relevant contemporary treatises on art (especially the book on the art of painting by Rembrandt’s former pupil van Hoogstraten, published in 1678), it has been possible to reconstruct aspects of the contemporary art-theoretical background and terminology that would have shaped Rembrandt’s ideas and practices. A great quantity of notary reports and other documents on legal, financial, and family affairs have come to light and are still being discovered, and a growing amount of recovered archival material sheds light on early owners of Rembrandt’s works. As a result, Rembrandt studies continued to evolve into the 21st century. The results of such studies will always leave room for new interpretations as historical perspectives continue to change. | Ernst van de Wetering © Encyclopædia Britannica. 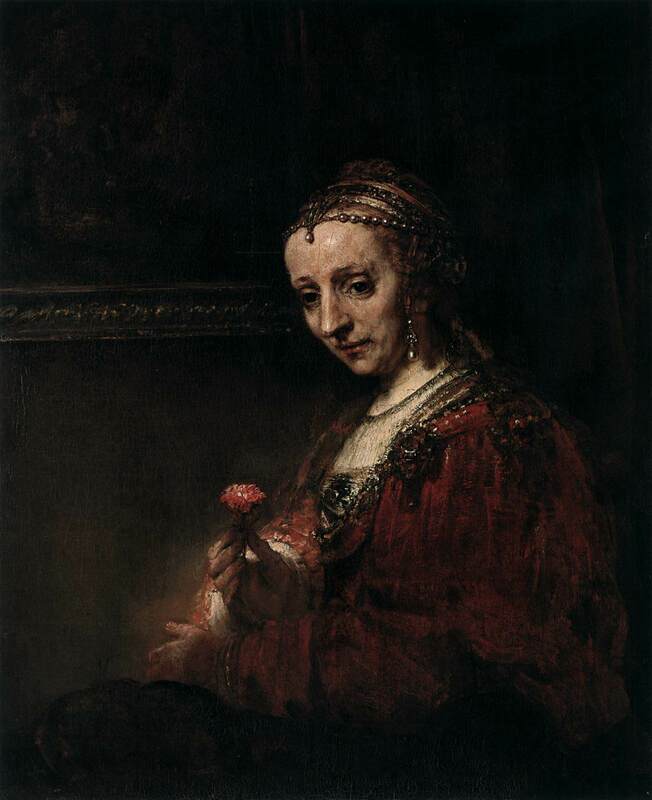 Rembrandt Harmenszoon van Rijn, meglio noto semplicemente come Rembrandt (Leida, 15 luglio 1606 - Amsterdam, 4 ottobre 1669), è stato un pittore e incisore olandese. Rembrandt Harmenszoon van Rijn nacque il 15 luglio 1606 a Leida nei Paesi Bassi. Era il quarto di sei figli sopravvissuti all'infanzia su dieci complessivi avuti dalla madre (il nono in ordine di nascita). La sua era una famiglia benestante nonostante il padre fosse un mugnaio e la madre la figlia di un fornaio (è dimostrato dai testamenti dei genitori deceduti rispettivamente nel 1630 e nel 1640). Da ragazzo frequentò la scuola di latino e si iscrisse quindi all'Università di Leida, anche se secondo un contemporaneo mostrava già un grande talento per la pittura: ben presto venne messo a bottega da uno dei pittori storici di Leida, Jacob van Swanenburgh. Dopo un breve ma importante periodo di apprendistato ad Amsterdam con il celebre pittore Pieter Lastman, Rembrandt aprì uno studio a Leida, che condivise con l'amico e collega Jan Lievens. Nel 1627 Rembrandt iniziò ad accettare a sua volta degli apprendisti, tra i quali Gerrit Dou. In un articolo pubblicato il 16 settembre 2004 sul New England Journal of Medicine, Margaret S. Livingstone, docente di neurobiologia della facoltà di medicina dell'Università di Harvard, suggerisce che Rembrandt, i cui occhi sembrano avere avuto un difetto nell'allineamento della vista, soffrisse di "perdita di stereopsi", una condizione in cui risulta difficile o impossibile percepire correttamente la profondità. È giunta a questa conclusione dopo aver studiato 36 autoritratti dell'artista. Dato che non possedeva una normale visione binoculare, il suo cervello automaticamente sceglieva di utilizzare un solo occhio per l'osservazione. Questa particolare disabilità potrebbe avergli fatto percepire come fossero piatte molte delle immagini che vedeva, agevolandolo poi nel trasferirle sulle bidimensionali tele. 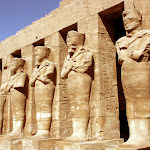 Secondo la Livingstone questo potrebbe essere stato un vantaggio per un grande pittore come lui perché "Gli insegnanti d'arte spesso dicono agli studenti di chiudere un occhio per percepire come piatto ciò che osservano. Perciò, la "perdita di stereopsi" potrebbe non essere un handicap - ma anzi rivelarsi un vantaggio - per alcuni artisti". Victor Hugo, nella seconda parte de I Miserabili, nei capitoli dove mette in scena la battaglia di Waterloo, colloca Rembrandt tra i pittori che hanno nel pennello il caos aggiungendo con intenti esemplificativi che, per dipingere un battaglia, Rembrandt vale meglio di Adam Frans van der Meulen". Un altro dipinto Pilato che si lava le mani è considerato di dubbia attribuzione. I pareri hanno preso vie considerevolmente diverse a partire dal 1905, quando Wilhelm von Bode lo descrisse come "un lavoro piuttosto anomalo" da parte di Rembrandt. La maggior parte degli studiosi a partire dagli anni quaranta lo hanno datato al decennio del 1660, attribuendolo ad un anonimo allievo. La composizione presenta dei tratti in comune con le opere della maturità di Rembrandt, ma l'effetto rembrandtesco resta superficiale e non riesce a trasmettere nulla che somigli alla capacità di dosare la luce e l'abilità nella composizione del maestro. A puro livello di ipotesi è stato proposto il nome del suo unico allievo conosciuto di quel periodo, Arent de Gelder. Il metodo di lavoro che Rembrandt adottava nella propria bottega è uno dei fattori che maggiormente acuiscono le difficoltà nella attribuzione dal momento che, come molti altri artisti prima di lui, incoraggiava i suoi studenti ad imitare i suoi dipinti , talvolta riservandosi la rifinitura o gli ultimi ritocchi, per poi venderli come originali o come copie autorizzate. Inoltre il suo stile si rivelò tutto sommato di facile imitazione per gli allievi più dotati. Altre complicazioni derivano dall'ineguale qualità di alcuni degli stessi lavori di Rembrandt e dalle sue frequenti evoluzioni stilistiche. È molto probabile che non si riuscirà mai a raggiungere un generale consenso su cosa sia e cosa non sia da considerarsi come genuina opera di Rembrandt.